From simple to classic to spectacular - whether you are a bride-to-be or a member of the bridal party, going to prom or Mom-prom, participating in a pageant, or simply going out for the evening, we have necklaces and necklace sets for all tastes. Remember, the right jewelry throws attention where you want it, and there's nothing like the right necklace to bring all eyes towards your lovely face. For too long we have seen many celebrities and advertisers show a wide expanse of bare chests that beg to be adorned. The pendulum is long overdue to go the other way. Show your style independence and bring glamour back! 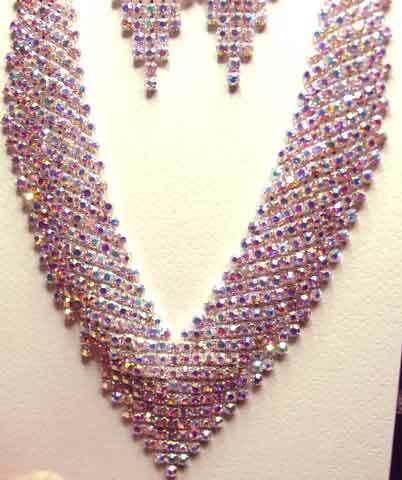 Description: Sassy South Aurora Borealis and Clear Rhinestone V'd Necklace and Earrings Set - Rows of aurora borealis rhinestone chain are outlined with clear rhinestone chain. Set in silvertone, the necklace has a lobster claw clasp and extension chain, and should fit a 13.5" to 18" neck (could easily be extended farther if needed.) Necklace is not quite 3/4" wide. Pierced (post) earrings are 2" x 3/4". Very sparkly in person. Great price point. 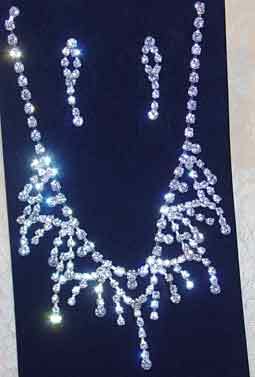 Description: All Aurora Borealis Rhinestones V Necklace and Earrings - Set in silvertone, this slightly domed necklace has a fringed edge and is 3/4" wide. Lobster claw clasp with extension chain, this should be adjustable from about 14" to 20". Pierced (post) earrings are about 2 1/4" x 3/4". 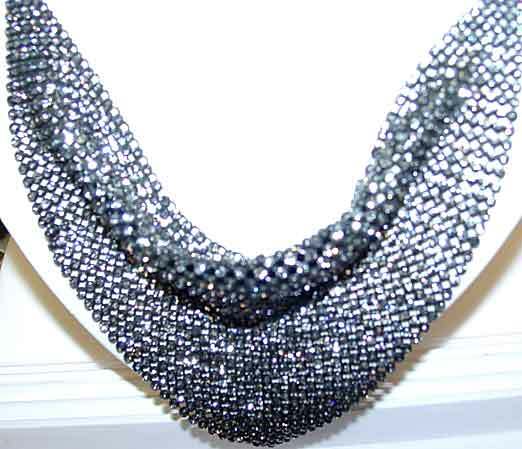 Lots of sparkle, this will go nicely with all any color. 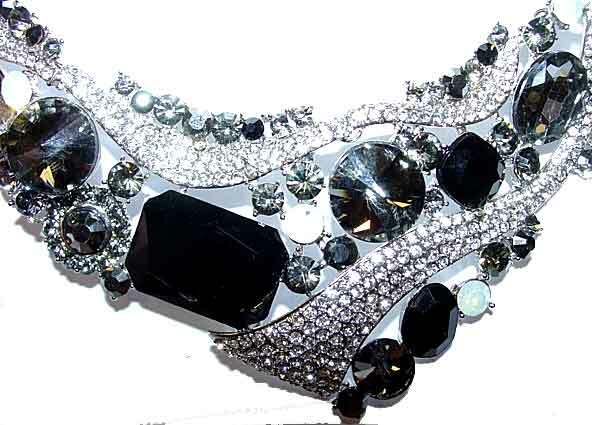 Description: Aurora Borealis Back Necklace Attachment - Most back necklaces are made so that the front and the back are one attached piece. This is made to attach to an existing necklace, so whatever look you want in front is not necessarily influenced by what you see in back! An ingenious solution! 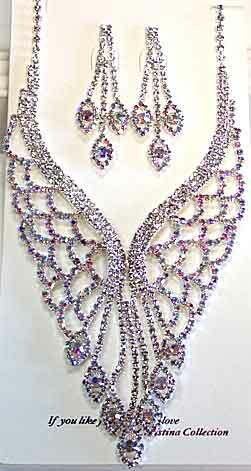 This is done in all aurora borealis rhinestones set in silvertone. Entire length is about 8", with the single line being about 4", and the triple line part the remainder. Triple area width is about 1 1/8". This could conceivably be used as a pendant and hung on a chain, ribbon, etc. and worn in front as well. Be creative! 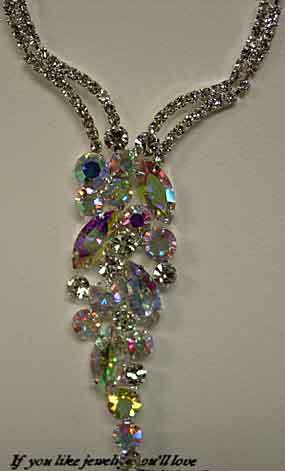 Description: Clear and Aurora Borealis Rhinestone "Butterfly" Necklace and Earrings - All of the scallops and the stones that are encircled are AB's, with the straighter lines done in clear. 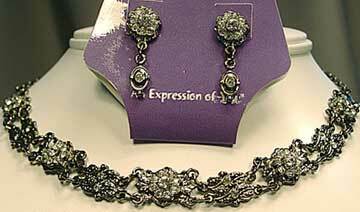 Silvertone setting, earrings are pierced (post), 2 1/4" x 3/4". 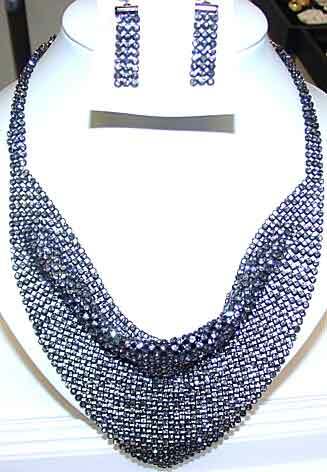 Necklace is 2 1/2" at widest point center front and will extend to over 19". Flattering and a knockout with a simple dress. 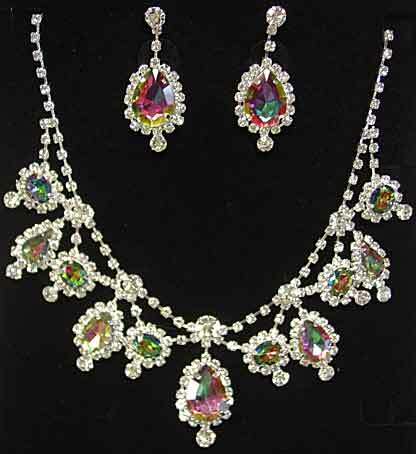 Description: Oval Halo Necklace and Earrings Set in Aurora Borealis/Clear Rhinestone - Pierced (post) earrings are 1" x 1/2"; necklace is adjustable to 19 1/2" with 1 1/2" x 3/4" pendant. Silvertone setting. Much more expensive looking than the price would indicate. 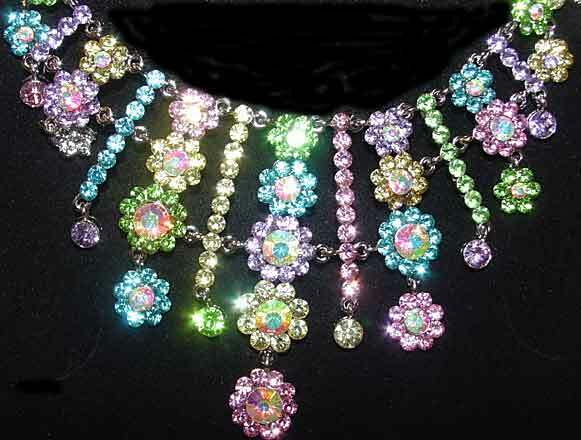 Description: Clear and Aurora Borealis Rhinestone Scalloped Collar Necklace Set - I have taken this against different backgrounds so that you can hopefully tell the difference between the clear and the AB stones, but if not, the smaller scallops and the single stones are AB's and the rest are clear. 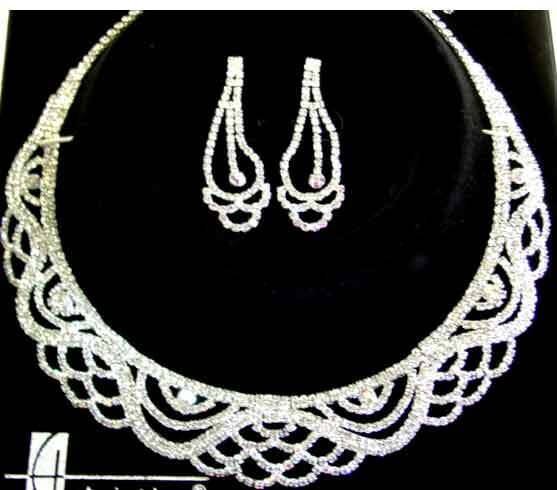 Silvertone setting, earrings are post (pierced), 2 1/4" x 3/4"; curvature of the necklace makes it difficult to measure accurately but should fit at least up to an 18" neck, and about 1" at widest point at center front. The openness of the design keeps this lacey and delicate feeling. 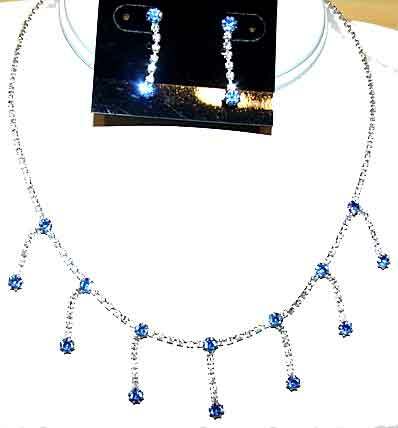 Description: Multi-Blue/Volcano/Clear Rhinestone Y Necklace and Earrings Set - This design uses small light blue and slightly larger bright blue rounds, accented with a specialty color pear that is similar to a volcano stone, with flashes of red, blue and yellow. Upper chain is done in all clear rhinestones. 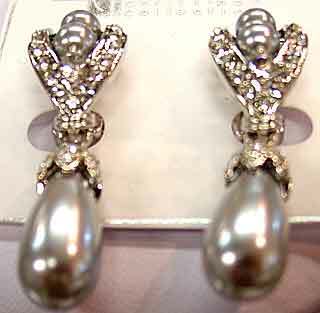 Silvertone setting, earrings are post (pierced), about 1 1/2"x 1/2". Necklace has 2 3/4" center drop, 3/4" at widest point, this will fit up to a 19 1/2" necksize. Super price. 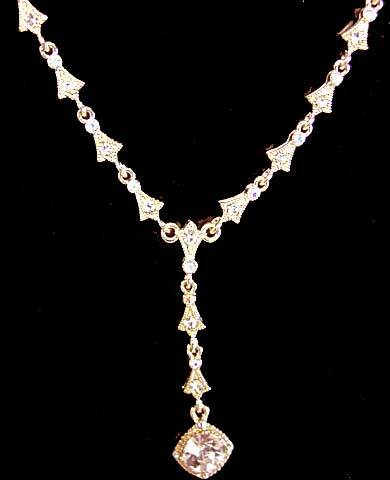 Description: Clear Pave Rhinestone Hinged Necklace and Earrings Set - In goldtone, this is quite unusual in that it is a hinged necklace - this opens in front and you slip it around your neck from the back. Simplified version of a Chanel design from the 1940's, this is elegant and out of the ordinary. 3/4" at widest point and slightly domed, this measures 4 3/4" x 5" for the necklace opening, front opens to at least 4 1/4" for easy putting on and taking off. Matching paved earrings are pierced, about 1 1/8" x 3/8", also slightly domed. Excellent price, designer look. 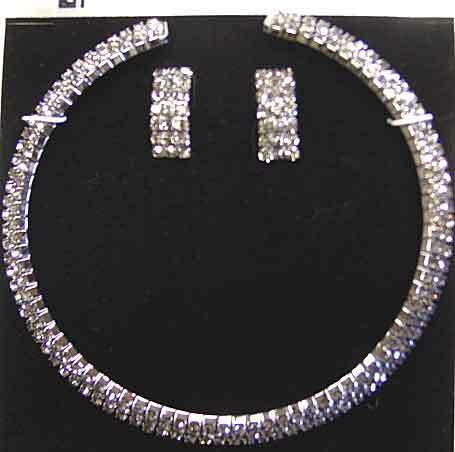 Description: Articulated Collar Necklace and Earrings Set - Each vertical line of rhinestones you see on this necklace are alternating "bars" of either 4 or five clear rhinestones (if I counted correctly, there are 71 individual bars) making this fit beautifully, conforming to almost any neck. Adjustable up to about 17 1/4", 1 1/4" wide. Strung at the top and bottom on transparent fishline type material, you may wish to have it restrung on chain for security. Earrings are 1 5/8" x 3/4", pierced, all set in silvertone. 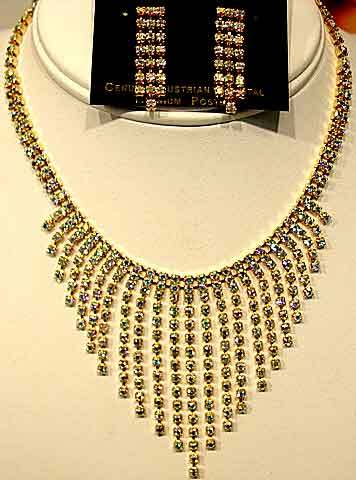 Very similar to pieces we have found in vintage jewelry made by KJL and Ciner, this is a designer look without the pricetag. HRH the Duchess of Cambridge (Kate Middleton) was recently seen wearing a very similar necklace that wasn't quite as wide. Description: Swarovski Glass Pearl/Eternity Ball Necklace and Earrings Set - The color of these pearls is platinum; in some lights they have a slightly brown cast, in others, very slightly green, so these verge on a taupe color. They seem to work very nicely with some of the metallic colored dresses for mothers of the bride currently on the market. 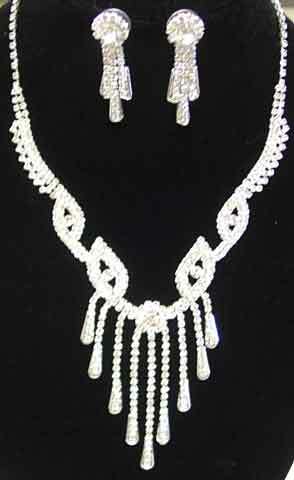 The necklace is approximately 17 1/4", strung on silk with french wire finishing and a lobster claw clasp in silvertone. Earrings are pierced, using french hook findings, and are 1 1/4" from top of hook. 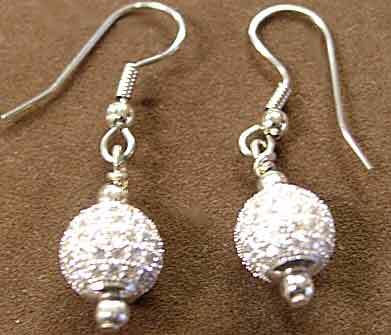 Because the earrings only use the eternity balls, they also make a great stand-alone pair of earrings. Please notice in the closeups that these are top of the line eternity balls with almost no metal showing. 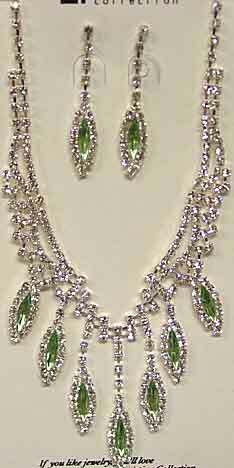 Description: Aurora Borealis and Clear Rhinestone "Waterfall" Necklace and Earrings Set - A grace mix of marquise and round stones cascades down your decolletage, mixing AB and clear stones. 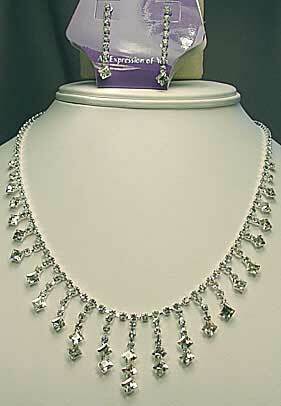 Chain portion of the necklace is clear rhinestone chain, in silvertone, as are the upper part of the earrings. Necklace has adjustable lobster claw clasp up to around 16 1/2"; an extender could easily be added if you need additional length. Center of necklace drops about 2 3/4". Earrings are pierced, 1 3/4". Stones are all prong set. 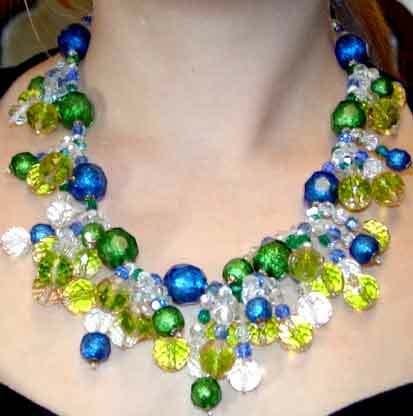 If you don't own an aurora borealis necklace, you SHOULD, as it goes well with many different colors, and is often a great option when "matching" colors don't work or aren't available, which is why this classic is as popular today as it was when aurora borealis stones were introduced in the 1950's. Description: Fuchsia/Orange/Faux Opal/Clear Necklace and Earrings Set - Done with a gracefully v'd design, this set combines fuchsia, orange and an unusual opal-y rhinestone that looks kind of like a milky clear stone but flashes light yellow. 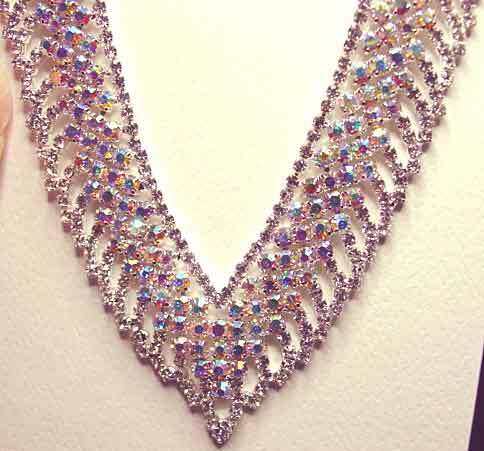 All is surrounded by clear rhinestone chain, using a double row around the v shape, and single row going up the sides. 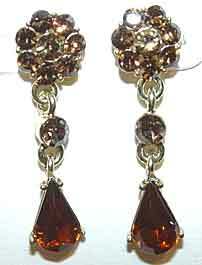 Earrings are also a v'd dangle, using orange and clear rhinestones. Silvertone, the earrings are pierced and measure 1 1/2" x 7/8", necklace adjusts from about 15" to about 19", 1 1/2" at center front. I love this "hot" color combination, which can be found in both eveningwear and daywear. 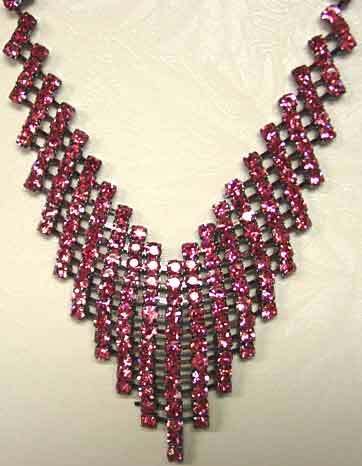 Description: Flexible Rhinestone Collar in Hematone - I have taken both flash and non-flash photos of this piece - 6 rows of clear stones go most of the way around the piece, with the back portion graduating down to a single row at the clasp. Set in hematone, this seems to be made with a wire framework so it has a certain amount of flexibility and can, if GENTLY manipulated, conform to your neck. Somewhat difficult to measure on the curve but seems to be about 16" inner circumference, with an additional 3" of tail. 3/4" wide at 6 row portion. This looks like a pricey designer piece, at a fraction of the cost. 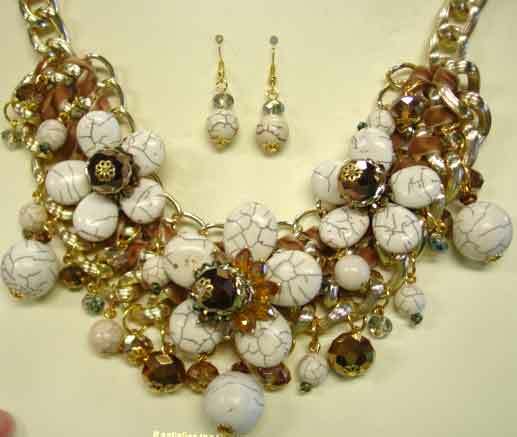 Description: Faux Howlite and Multi Brown Crystal Bead Floral Motif Necklace and Earrings Set - This is the year of the statement necklace, yes? 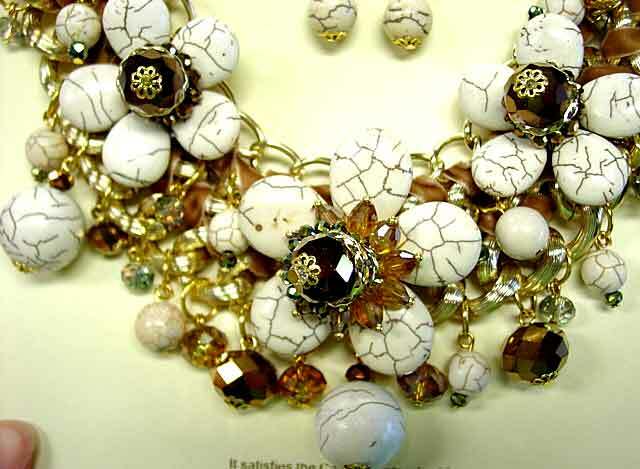 Simulated howlite, in cream with dark brown matrix like lines, is in the form of beads and flattened oval disks which make up florals centered with a large copper-metallic bead surrounded by a collar of tiny copper beads, with the center floral having dark olivine colored beads and then a lower row of topaz beads. More beads dangle at the lower edge and within the body, which is also interlaced with fawn colored velvet ribbon. 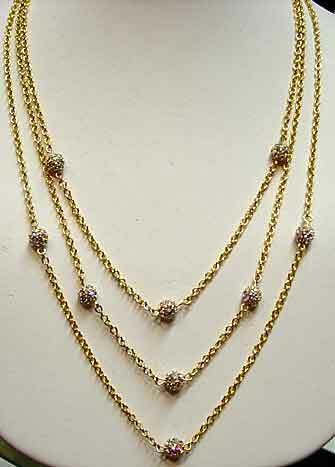 Goldtone heavy chain setting, necklace is adjustable up to 18", 2 3/4" at center. Pierced earrings are pierced, french wire, about 1 1/2" dangle from top of hook, and would be very wearable on their own. Nice weighty feel, a designer look without the designer price. 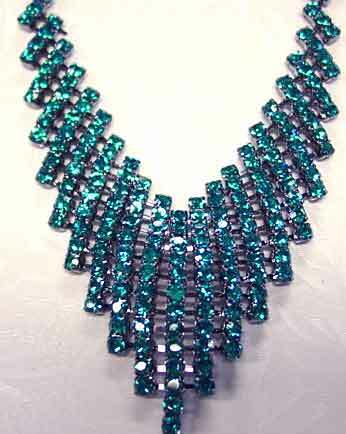 Description: Teal Rhinestone V'd Necklace and Earrings Set - Graduating rows of teal colored rhinestones, set in hematone, form a V shaped design. This necklace extends from about 13 1/2" to 19" so it should fit most people. 1 1/4" at center front. 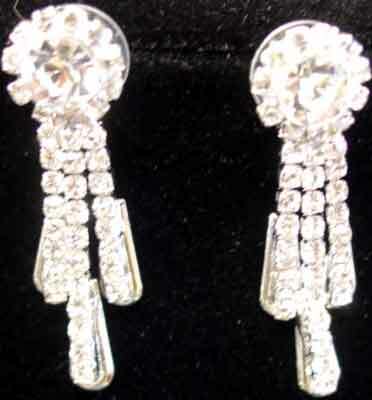 Earrings are pierced (post) and are approximately 2" at longest point. Very affordable and flattering. 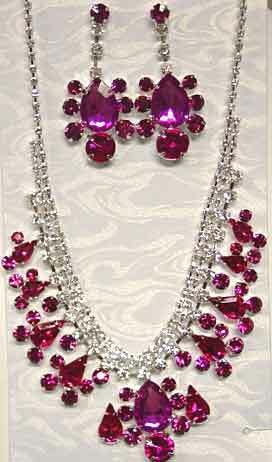 Description: Rose Pink Rhinestone V-d Necklace and Earrings - The same design, only with rose pink rhinestones. 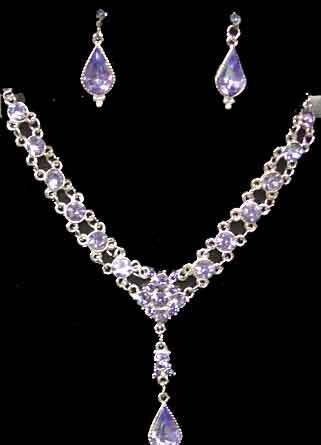 Description: Mariell Tanzanite Rhinestone Necklace and Earrings Set - Y-style neck set in tanzanite rhinetone set in antiqued silver, with a pear shaped stone forming the dangle on both the necklace and earrings. 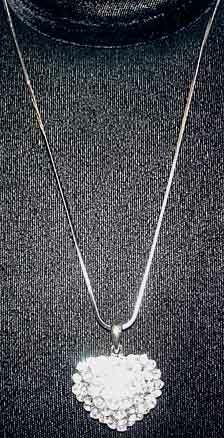 Upper part of necklace is in silvertone figaro type chain, with necklace adjusting from 16" to 19 3/4". Center drops about 1 1/2" below the chain. Pierced (post) earrings are about 1". 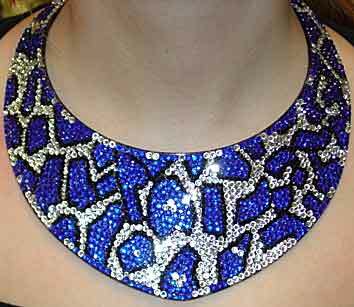 This blue-purple color is a difficult-to-find rhinestone color. 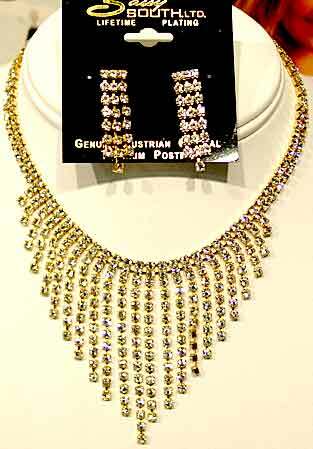 Description: Vitrail and Clear Rhinestone Festoon Necklace Set - If you've never seen vitrail you are in for a treat. Often described as a watermelon stone because is flashes pinks and greens, it also has an irridescent quality that makes it almost a more intense version of aurora borealis. 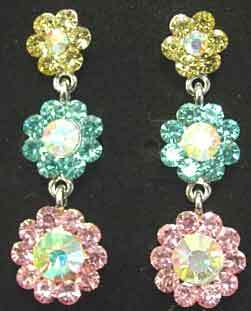 This set uses colored pears and ovals, all surrounded with clear rhinestone chain and accented with slightly larger clear rounds. 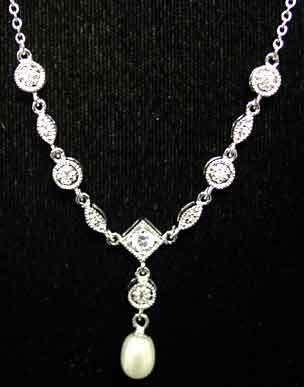 Necklace extends to 18 1/2", silvertone setting, with center dangle about 1 1/4" below the chain. Pierced (post) earrings are about 1 3/4". 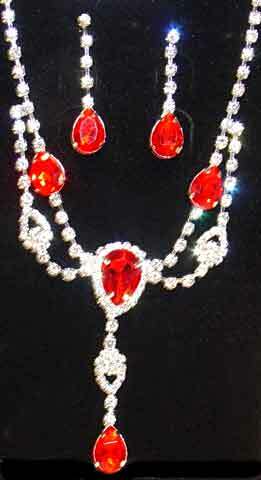 Great for a pageant or any other special occasion, and a great price. From Sassy South. 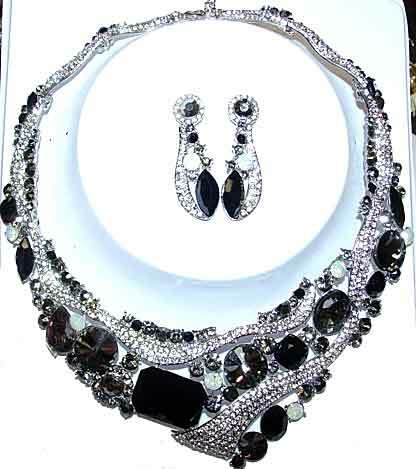 Description: Black Diamond and Clear Rhinestone Necklace and Earrings Set - Slightly asymmetrical, this fascinating design uses clear rhinestone swirls accented with black diamond teardrops in a v shape pattern for the necklace and a coordinating design for the earrings. 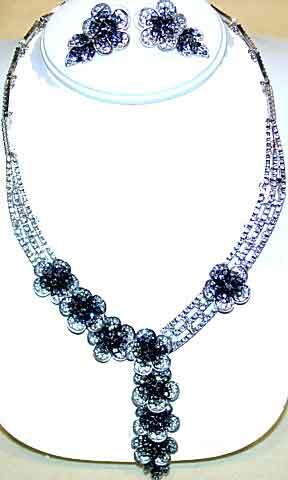 Set in silvertone to make the colors "pop", the necklace adjusts to about 18" with a 2" center. Earrings are pierced (post) and are about 2". 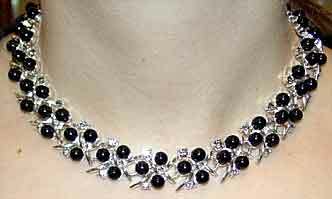 Very elegant with black or silver. 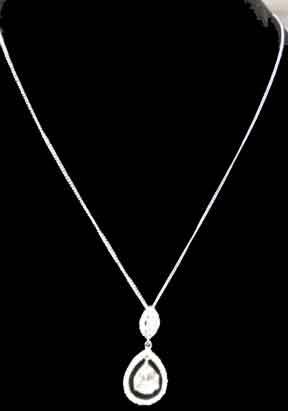 Description: Clear CZ Halo Style Pendant Necklace - Lovely pear shaped stone is surrounded by a separate line of small rounds and dangles from a smaller marquise, also surrounded by small rounds. All suspended from a simple silvertone adjustable chain (16" to 18"), elongated lobster claw clasp. 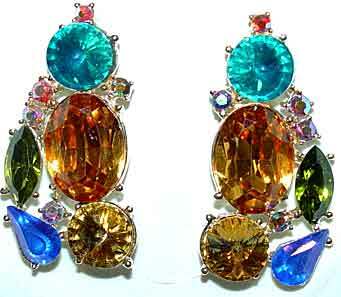 Co-ordinating earrings available, please inquire if interested. 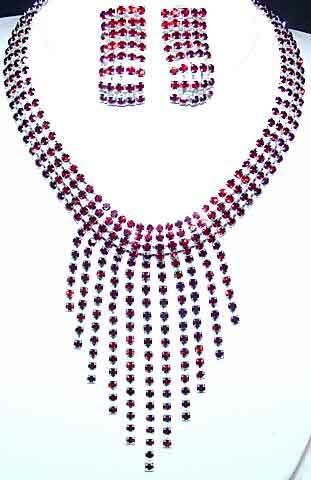 Description: Aurora Borealis and Clear Rhinestone Fringe Style Necklace and Earrings Set - Delicate looking set with aurora borealis stones paste set on the center of the chain, from which hang graduating aurora borealis stones, surrounded by tiny clear paste set rhinestones. 16" with 2 1/2" extension. Pierced (post) earrings are 3/4". 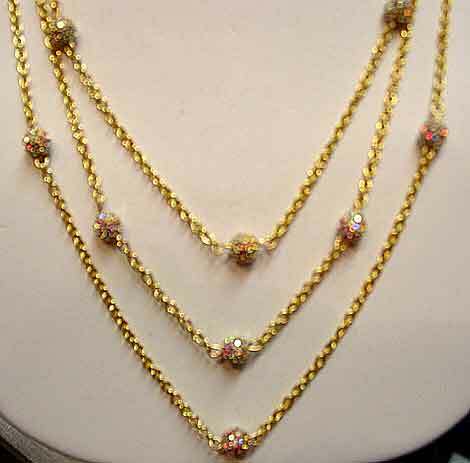 Description: Clear Rhinestone Zig-Zag "Y" Necklace Set - All prong set stones, with small fleurettes set in a zig-zag for a 2 3/8" drop. 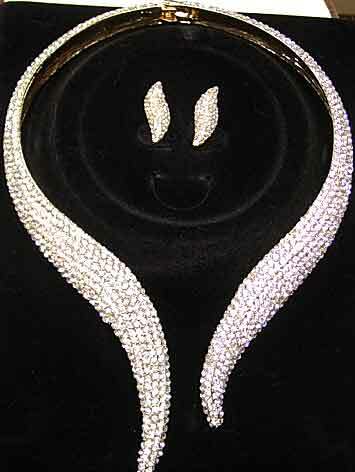 Clear rhinestone chain for the sides, adjustable from 14" to 17 1/2". Silvertone setting. 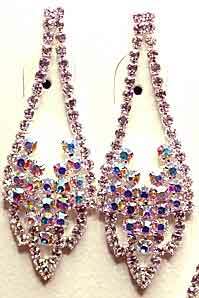 Earrings are pierced (post) and fall 1 3/8" with a single fleurette ending the single strand of rhinestone chain. Delicate but still noticeable. 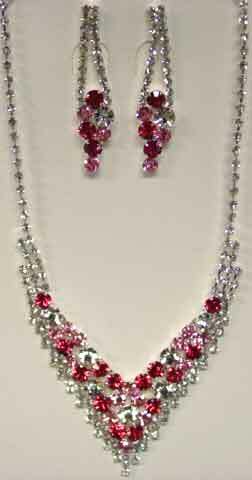 Description: Multi Pink and Clear Rhinestone "V" Necklace and Earrings Set - The rhinestone industry is finally starting to do more color mixes than they have in the past - this interesting set uses pale (blush) pink and a dark pink rhinestone with clear stones. I would consider the top picture on my computer screen to be more color accurate, with the dark pink having a peach cast to it in certain lights. 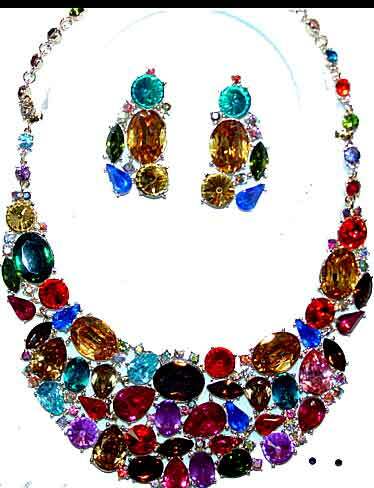 All colored stones on the necklace are in the v portion, with small clear rhinestone fringe around the bottom. 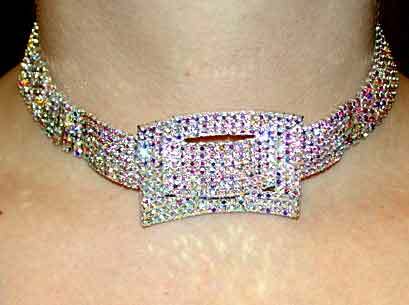 Adjustable from 14" to 18", silvertone setting, 1" wide at center front, graduating down to rhinestone chain at the sides. Pierced earrings are about 2" long. Description: Elaborate Teal and Clear Rhinestone Necklace and Earrings Set - Single teal lucite pears in the earrings are necklace are surrounded by deep aqua glass rhinestone rounds and pears, with both accented with single lucite rivolis. 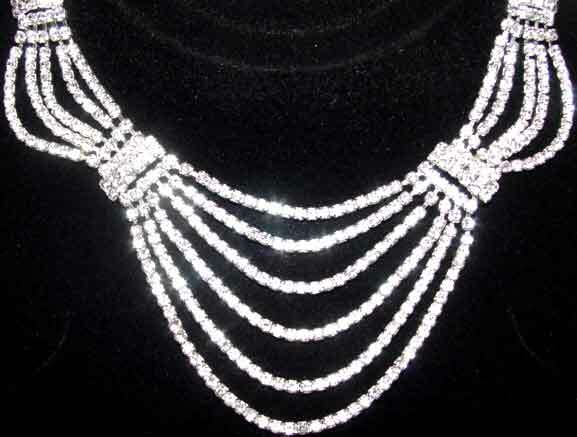 Clear rhinestone chain in two sizes graduates from a single to a triple strand on the necklace. Necklace extends from about 13" to 16 1/2" (additional extension chain could be added if needed.) Silvertone setting, necklace is 1 1/2" at widest point. Earrings are 2" x 7/8" wide. Any green cast to the large pears is a reflection of the clothing I was wearing when I photographed this! 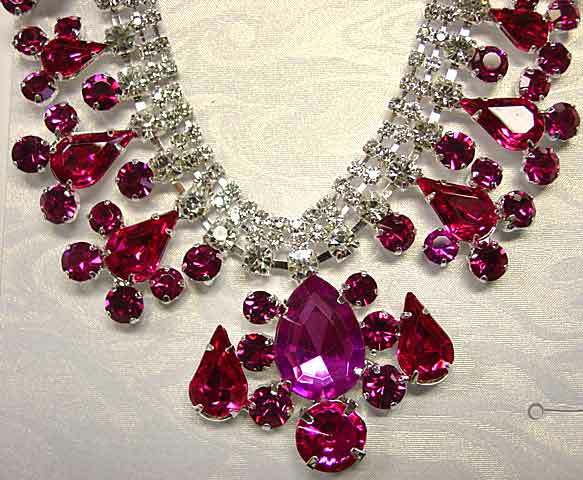 Description: Elaborate Violet/Fuchsia and Clear Rhinestone Necklace and Earrings Set - Same design as above, but with violet colored lucite pears surrounded by fuchsia stones. Very subtle color difference but there. 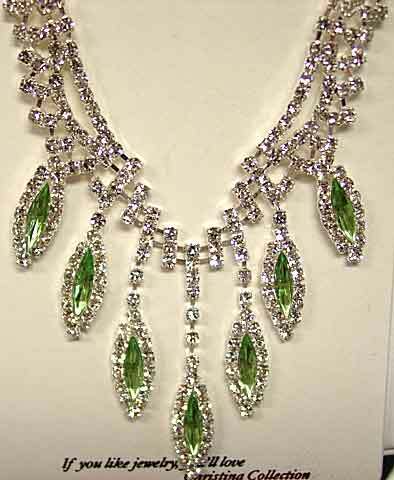 Description: Lime Green and Clear Rhinestone Navette Bib Necklace and Earrings Set - Seven rhinestone surrounded navettes (marquises) dangle from an elaborate clear rhinestone chain design. 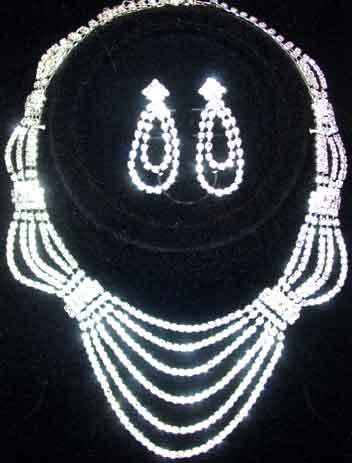 Silvertone setting, necklace adjusts from about 13" to 17", longest dangle is about 1 3/4", as are the pierced earrings. Very flattering set at a great price! 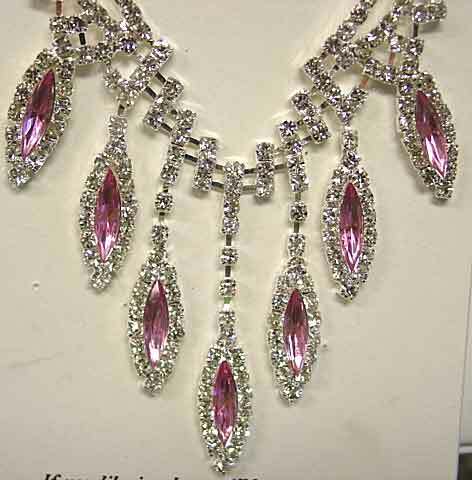 Description: Blush Pink and Clear Rhinestone Navette Bib Necklace and Earrings Set - Seven rhinestone surrounded navettes (marquises) dangle from an elaborate clear rhinestone chain design. Silvertone setting, necklace adjusts from about 13" to 17", longest dangle is about 1 3/4", as are the pierced earrings. Very flattering set at a great price! 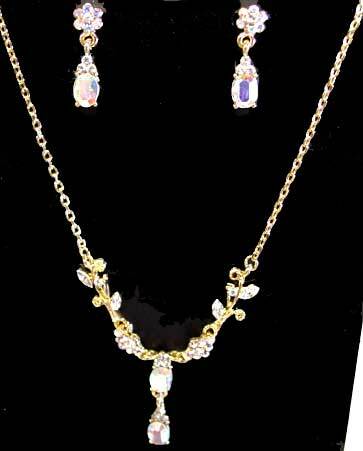 Description: Renaissance Look Necklace & Earring Set in Clear/AB/Goldtone - This is primarily a clear rhinestone in goldtone set, but the smallest rounds that end each triangular link are tiny aurora borealis stones. This simply doesn't come across in the pictures because they are so small, but they give just a tiny spark of color to this dainty, antique looking set. The necklace and each one of the earrings has one larger round clear, and each of the triangular (almost bell shaped) links is set with a small clear. Earrings are pierced, about 3/4"; necklace is 16" with 3 +" extension chain; "y" drop is 1 7/8". Back portion of the necklace is goldtone chain that you can see in the top photo. Description: Champagne Cubic Zirconia/Goldtone Necklace and Earrings Set - Champagne is kind of the new "darling" in cubic zirconia colors; this uses champagne colored CZ pear shapes in two sizes, alternating along the necklace chain and on the earrings with a medium topaz rhinestones. Goldtone setting almost gives the stones a peachy effect in certain lighting. 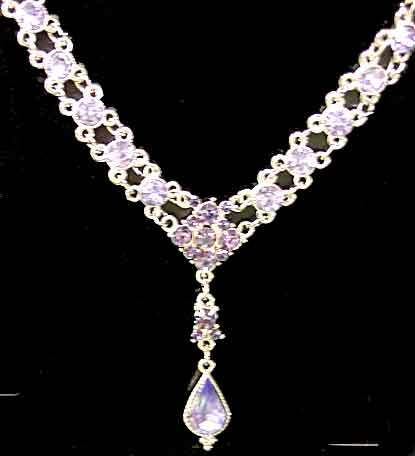 Necklace is 16" with 3+" extension chain; CZ drop is about 1 5/8". Earrings are pierced, 1/2". Quite a delicate looking set, and very pretty. Description: Aurora Borealis Rhinestone/Goldtone Necklace and Earrings Set - Aurora Borealis rhinestones in oval and small rounds make up almost all of the stones in this set, with a few clear marquises for leaves and set of three small clear rounds above the ovals on both the necklace and the earrings. Goldtone chain, the necklace is 16" plus a generous 3" extension chain, lobster claw clasp. Earrings are pierced, about 7/8" long. Perfect for prom or as a bridesmaid set. This color combination is actually becoming difficult to find. 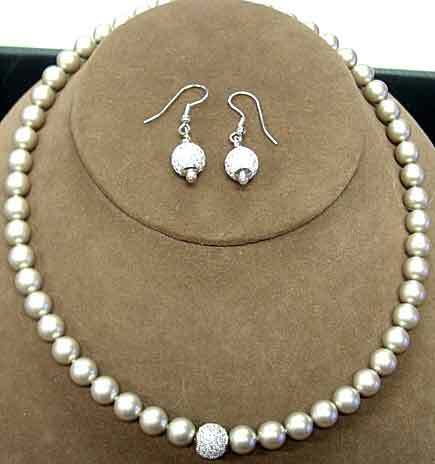 Description: Champagne and Clear CZ/Silvertone Necklace and Earrings Set - Champagne colored dresses, particularly for the mother of the bride and groom, have become very popular - here is the perfect "go with" that you can use far beyond the wedding. 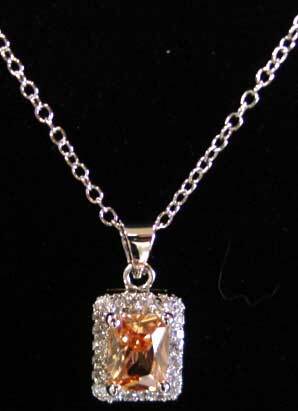 Rectangular champagne colored CZ's are beautifully faceted, prong set, and surrounded by a border of small clear CZ's, both for the pendant and the earrings. Silvertone setting, necklace is about 16" with an approx. 2" chain extender, which could easily be lengthened if needed. Earrings are post, the same size as the pendant, about 7/16" x 5/16". These were difficult to photograph; the pendant closeup (below) will give you the best idea of what these look like. 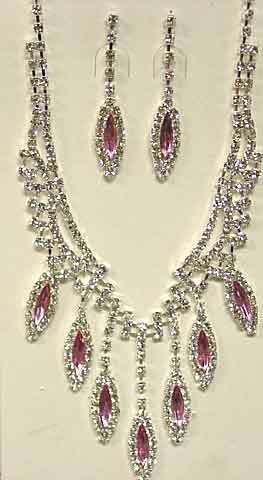 Description: Dynamic Clear Rhinestone Dangling Necklace & Earring Set - A beautiful design in clear rhinestones set in silvertone, with the dangles ending with rhinestone set "paddles". 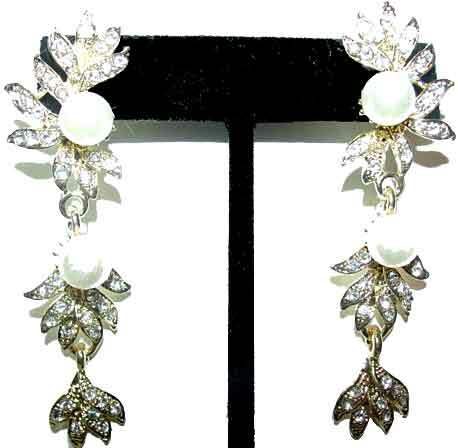 Earrings are topped with a large clear rhinestone surrounded by a border of smaller clears, from which suspend three dangles, the longest is in the center; pierced (post) style, 1 5/8" x 1/2". Center of necklaces carries out the same motif, but with more dangles, and the dangles are spaced a little farther apart. 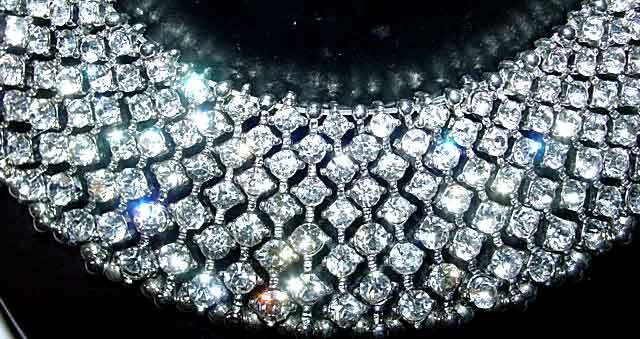 Marquise shaped design goes up each side, with the upper portion going from 3 to 2 to a single row of tiny clear rhinestone chain. Necklace is adjustable to about 18 1/2"; top to bottom at center measures about 2 1/2". Very sparkly, and very well priced. Description: Marielle "Back" Necklace in Glass Pearl, Clear RS Rondelles and Clear Crystal AB Beads - If you've been looking at dresses with low-backed necklines and wanting something to go down your back, this is an excellent style. Creamy glass pearls in 4 and 6mm alternate with two sizes of crystal aurora borealis bicone beads, lots of tiny goldtone beads. 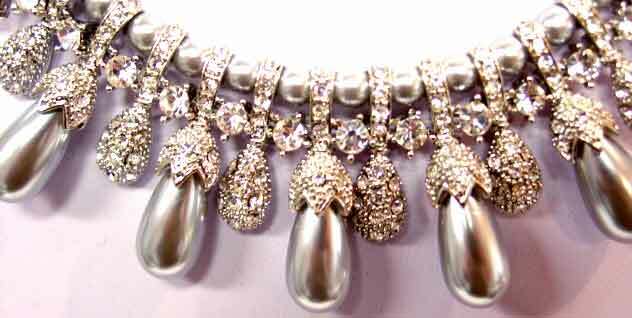 At the part of the necklace seen from the front are three separate stations with 6 tiny rhinestone rondelles (two at each station) to give what you see from the front just a little more "punch". 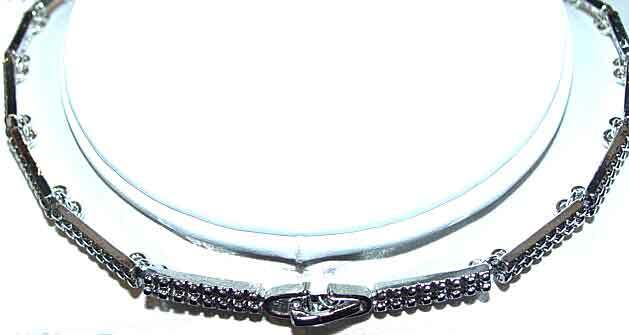 Lobster claw clasp, adjustable for a 15 3/4" to 16 3/4" choker. 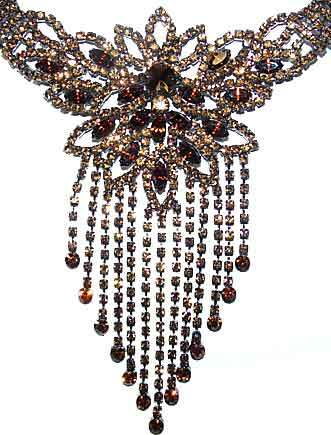 The tail portion is about 7 1/2" and ends with a single 10mm pearl and a single rhinestone rondelle. This could be customized if you need more room around the neck. Interestingly, this could be worn in reverse with the tail going down center front - Jennifer Anniston has been seen sporting a necklace with a similar very long "Y" style necklace in black diamonds, I think you can safely say that this is considerably less expensive! 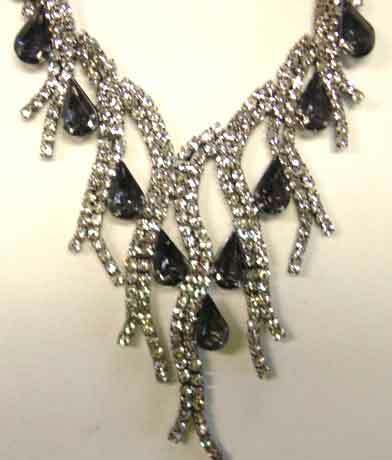 Description: Black Diamond/Clear Rhinestone Criss-Cross Necklace & Earrings Set - If you have a pewtery colored dress in need of a necklace, consider this style - black diamond (grey) rhinestones in double rows are centered between double rows of clear rhinestones, with the necklace front crossing. The long dangling earrings use two rows of black diamond stones for the shorter strands and clear rhinestones for the longer strands. Darkened silvertone setting, earrings are pierced (post) 2 1/8" x 3/8", and the necklace is adjustable to about 17 1/2", with each side about 5/8" wide. Much nicer in person. 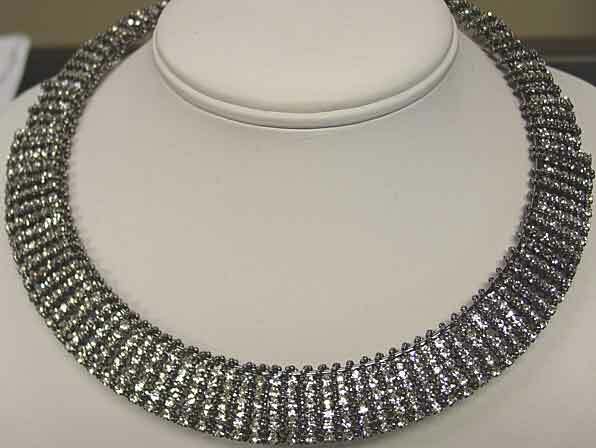 Description: Dark Grey Mesh/Grey Rhinestone Kerchief Necklace & Earrings Set - If you like the look of the vintage Whiting & Davis mesh, here is an updated version that instead of being all metal, uses rhinestones in place of the tiny metal octagonal links you normally see in these type of pieces. Subtle sparkle, fluid feel and a certain amount of variability in how you decide to shape the necklace. Earrings are pierced, about 1 3/4" x 3/8"; necklace V is about 6" x 7" and 4 1/2" wide at center front. 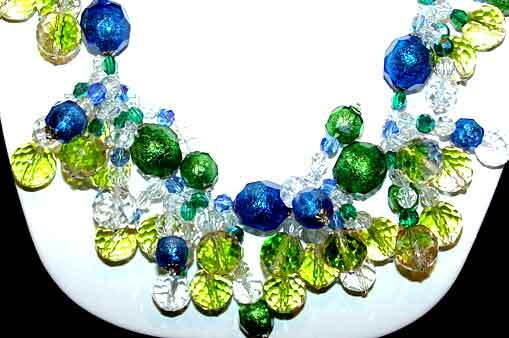 Necklace adjusts to slightly over 20". Again, this could be worn with a wide variety of clothing from casual to formal. 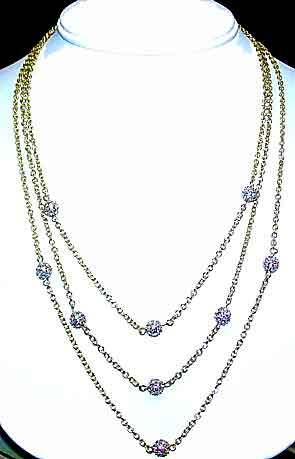 Description: Three Strand Chain and Eternity Ball Necklace - Done in goldtone chain and Beadelle brand rhinestone pave balls in goldtone and clear aurora borealis stones, this style can go from office to evening and would be flattering to almost anyone. Wear it with a black turtleneck or that gold metallic special occasion dress! If you are even minimally adept with pliers, you could even remove 1-2 strands to get the particular look you want depending on the occasion. What a versatile piece! Shortest strand is 16", longest is about 20", with a short extender at the back which could be lengthened if desired. 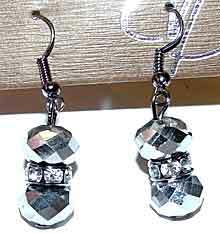 The pave balls are very sparkly and my camera focus was unable to get a good picture - you will love this in person! 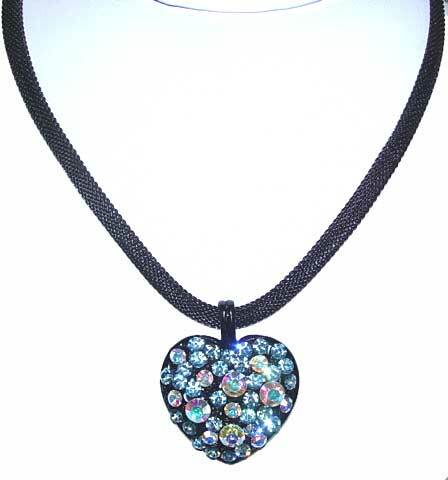 Description: Light Sapphire/Light Sapphire AB Heart Pendant Necklace - Heart shaped pendant is japanned (black lacquer finish) and set with light blue and light blue aurora borealis rhinestones. Chain is a black tubular mesh. Chain extends to about 17", heart is about 1 3/8" plus bale. 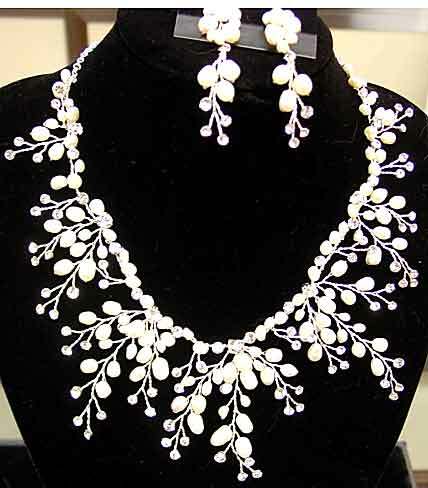 Description: Freshwater Pearl and Rhinestone "Beach Wedding" Necklace and Earring Set - While this beautiful set would be perfect for an outdoor wedding, it would be lovely for a lot of other occasions as well. Handwired set uses different sizes of freshwater pearls on silvertone branch-like wires, interspersed with clear rhinestones. Necklace is 2" at widest point, length is16 1/2" plus a 2" chain extender; pierced earrings are approximately 3" long. Very appealing and feminine. 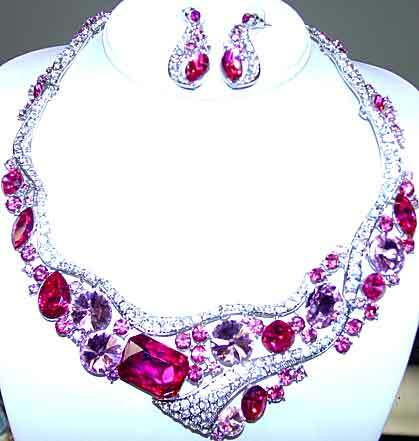 Description: Fuchsia/Blush Pink/Rose Pink/Clear/Necklace and Earring Set - Multi pink/fuchsia version of OS5-500. This also uses a multitude of stone shapes - rounds, octagonal, oval , rounded squares, marquises and rivolis (pointed top rounds). Indulating lines of clear pave run thru the design. Necklace is link style, slightly over 2" at center point, and tapers to 1/8" at the clasp. Lobster claw clasp with adjustable chain, this is 17" plus extender chain of 2", so 19" total possible. Earrings are pierced, 2" x 9/16" at widest point. Silvertone setting. Really pretty - if you have a gown that uses different shades of pink this would probably be perfect. 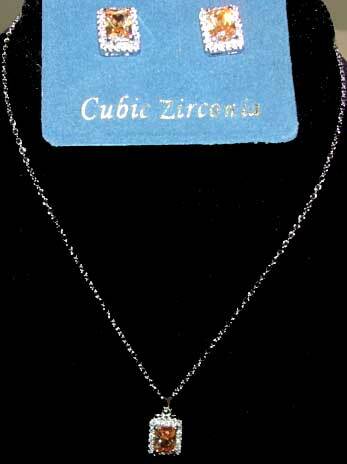 Description: Cubic Zirconia "Y" Necklace with Pear & Round Stones - Again, the stones were so sparkly on this piece that getting a good picture is extremely difficult. The "Y" section has two larger rounds surrounded by a border of very small rounds, that alternate with non-bordered rounds, culminating in a large pear surrounded by a border of small rounds. All CZ's are clear, chain is silvertone,adjustable from 16" to 18" (additional chain could be added if more length was desired.) Lovely for a bride, as well as beautiful for any formal occasion. 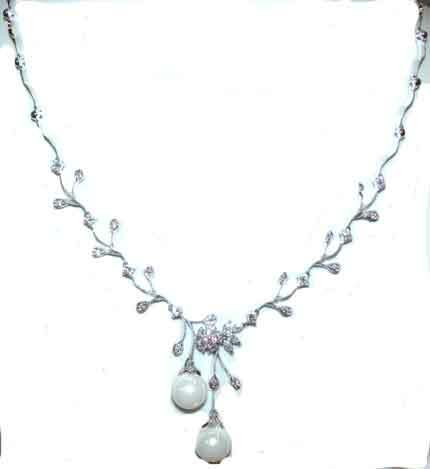 Description: Sterling Freshwater Pearl and Cubic Zirconia Necklace & Earring Set - Lovely "y" style necklace and earrings with an abstract leaf motif. Rhodium plated to keep tarnishing to a minimum. Neck chain alternates leaf and round shapes set with single cz's, with a square shape at the center (also set with a round cz) from which dangle another round shape and a single freshwater pearl. 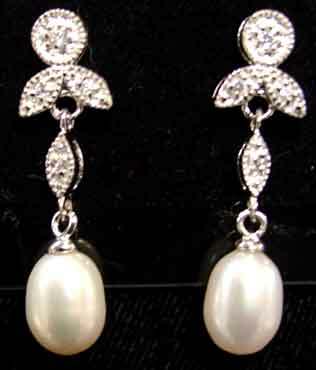 Pierced earrings continue the round and leaf shapes and also terminate with freshwater pearls. Necklace is 16" with center dangling about 1" below the chain. Earrings are about 1 1/4". 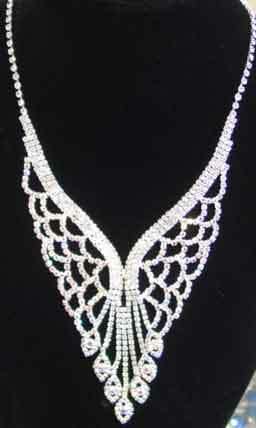 Perfect for the bride but could be worn by anyone for almost any dressy occasion. 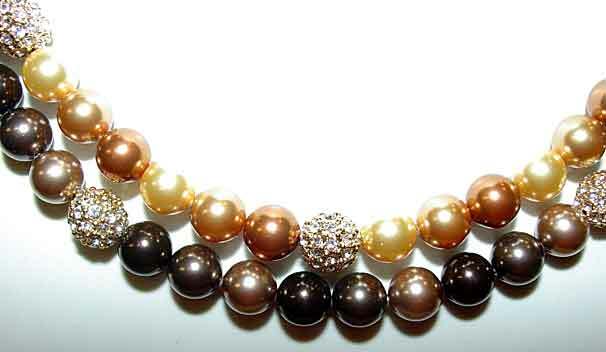 Description: Dark Chocolate Glass Pearl and Rhinestone Necklace/Bracelet/Earring Demi - Much of the brown clothing seen in stores recently has been really a deep brown, and this color of glass pearl would go very nicely with it. Necklace and stretch bracelet are centered with an eternity ball (pave set rhinestone ball) about 9/16" in diameter, glass pearls are about 1/2" in diameter. 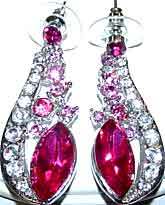 Earrings are a single peave suspended from a french wire finding. Adjustable necklace is about 16" plus about 3" of silvertone extension chain, lobster claw clasp. Bracelet is stretch style, bracelet inner diameter is about 6 3/4". Elastic stretches easily, so average to smaller wrist. Earring is about 1 1/2" from top of french wire hook. Don't forget, dark chocolate is GOOD for you! 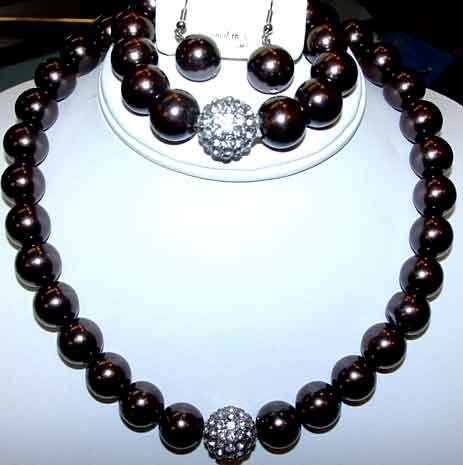 Description: Metallic Dark Silvertone Pear and Round Bead Collarette Set - A pretty design with beads in an "x" pattern across the bottom of the design using the pearshaped beads, and connecting rounds, and more rounds completing the back portion of the necklace. Silvertone findings, 18" plus 3" extension chain, about 1 1/4" at widest point. 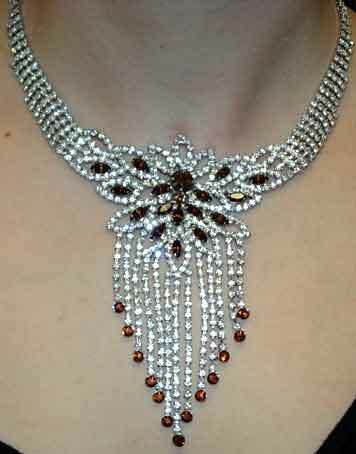 (necklace could be shortened if you wanted design closer to the base of the neck.) Earrings are a single pear dangling from a french wire finding, 1 5/8" long. Really pretty, flattering set. 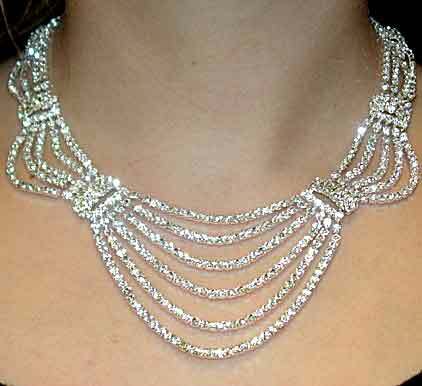 Description: Four Strand Illusion Necklace Set with Silver Metallic Beads - Each strand uses silvertone metallic beads flanked with small hematone beads creating "stations" at regular intervals, using 7,4, 7 and 9 stations on the 4 strands (shortest to longest). Bottom two strands also use a rhinestone rondelle in the center station. 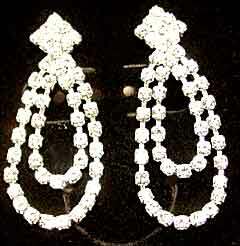 Earrings uses two beads separated by a rhinestone rondelle, suspended from french wire findings. Earrings are 1 1/2", shortest necklace strand is about 21", plus a 1 1/2" extension chain. 1 3/4" drop. 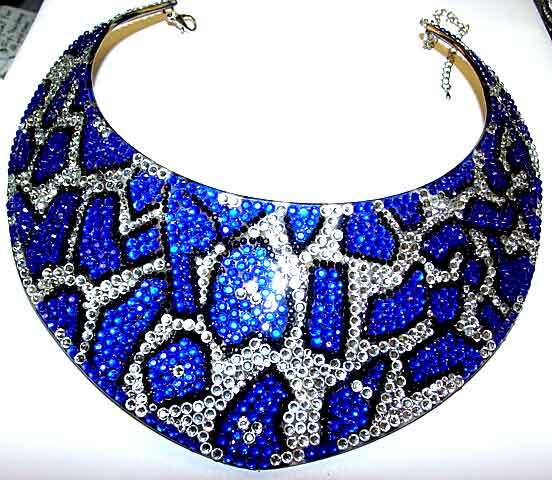 Description: Dynamic Sapphire Blue/Black/Clear Solid Collarette Necklace - Flatback stones are set in an animal print in a very intense blue (this color looks peacock blue in some lights, almost cobalt in others) bordered by black stones and then surrounded by all clears. Lobster claw clasp and long extender chain make this wearable by most sizes of necks (findings are silvertone). Back opening is 4 inches. Center point width graduates to around 2 5/8" from about 3/8" at the back. Lightweight, base is a transparent thin plastic similar to plexiglass or lucite. Reminiscent of Lieber style, without the price. 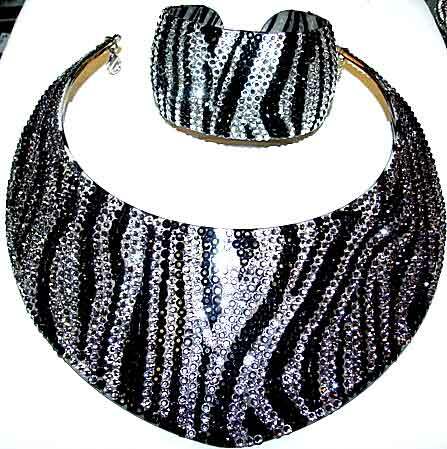 Description: Animal Print Solid Collarette Necklace and Cuff Bracelet Set - Done with all flatback stones in black and clear, this uses a thin lucite? plexiglass? base. Necklace graduates from about 3/8" to almost 3" wide at the center. Silvertone lobster claw clasp and long extender chain enable this to be worn by up to a 20" neck (opening in back is almost 4"). Cuff is 1 5/8" wide and measures almost 9" -back opening is quite small (about 3/4") but has a little flexibility. This is meant to be put on the side of your hand and then slid up your wrist. (This would possibly fit over your wristbone but you would need a very small wrist bone to do it.) This would be amazing with a black strapless dress. 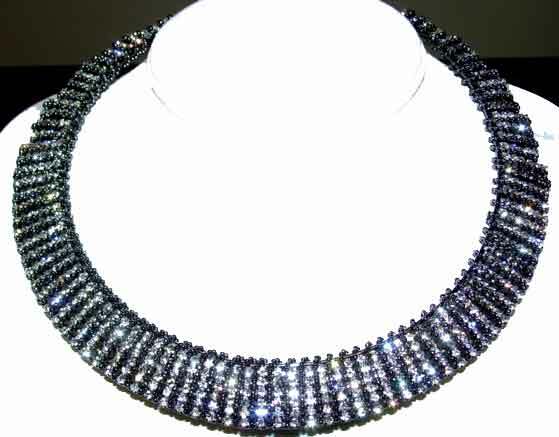 Description: Black/Black Diamond/CAD/Clear/Opaline Necklace and Earring Set - Yes, this actually has 5 colors of stones - black, grey, grey metallic, clear and opaline, which is almost a translucent AB - kind of a milky white with flashes of mild pastels, mainly pale yellow. This also uses a multitude of stone shapes - rounds, octagonal, oval , rounded squares, marquises and rivolis (pointed top rounds). Indulating lines of clear pave run thru the design. Necklace is link style, slightly over 2" at center point, and tapers to 1/8" at the clasp. Lobster claw clasp with adjustable chain, this is 17" plus extender chain of 2", so 19" total possible. Earrings are pierced, 2" x 9/16" at widest point. Silvertone setting. One of the opaline stones has a tiny black spot in it (please see closeup) so I have priced this at under our normal markup. 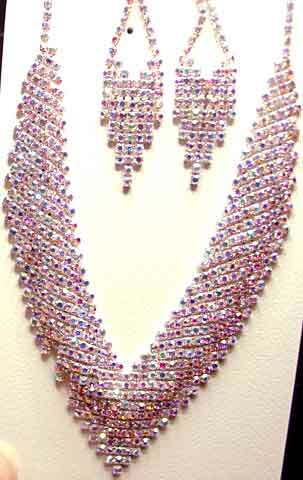 Description: Bow Motif Solid Collarette in White with Clear Aurora Borealis Stones - This is SO sparkly in direct light. 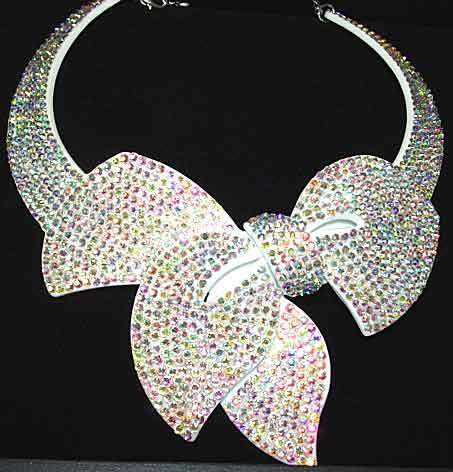 White plastic solid collar is all pave set with clear aurora borealis rhinestones, with a central bow motif. Collar is 15" plus a 3 1/4" opening, so 18 1/4" . Back has a silvertone lobster claw clasp and a long extender chain. About 3" at widest point. For the right dress this would be absolutely outstanding. 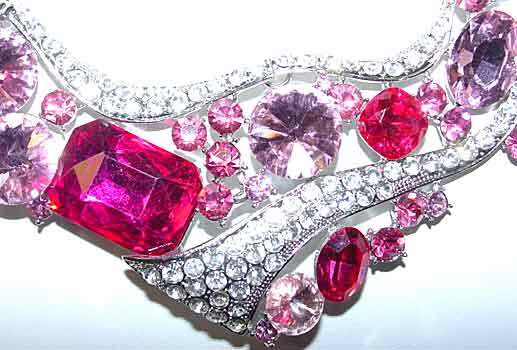 Description: Clear Rhinestone Heart Necklace - Of all the figural jewelry, probably the most beloved is the heart motif. 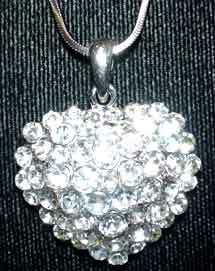 This domed heart pendant is set in silvertone and pave set with clear rhinestones. Nice quality bail. Chain is a squared snake with adjustable chain, about 15 1/2" to 17 1/2". Very affordable, this makes a nice gift. Heart is about 1" x 1". 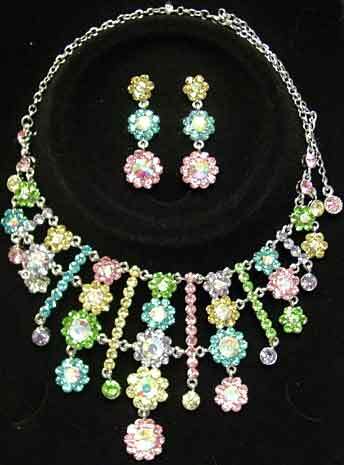 Description: Multi Pastel Rhinestone Floral Necklace & Earring Set - While this is a larger set, it is open enough not to be overwhelming to most people and is very pretty. 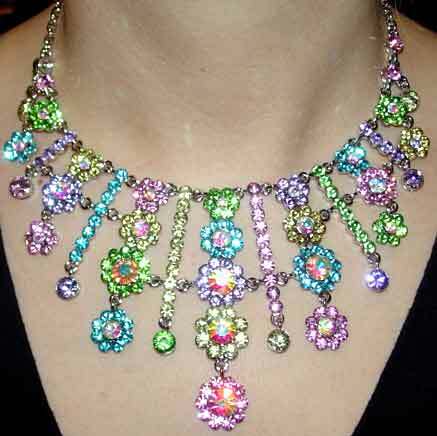 Lime, aqua, jonquil, pink and lavender rhinestones are used in this piece, with the floral centers in clear aurora borealis. Bib portion graduates from two to five flowers, with solid lines of color in between, approximately 3" at longest center part. This has an extra long adjustable tail so you should be able to fit almost any neck comfortably. Silvertone. Pierced earrings are 1 7/8" jointed dangles. Great set. 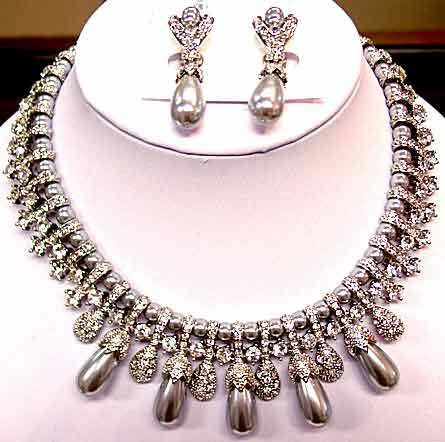 Description: Spectacular Light Grey Glass Pearl/RS Elaborate Necklace & Earring Set - Back by popular demand, this necklace uses an unusal quantity of rhinestone set parts. Central motif alternates rhinestone set "paddles" with rhinestone capped grey "eggplant" shaped glass pearls, all suspended from a row of smaller round grey glass pearls. 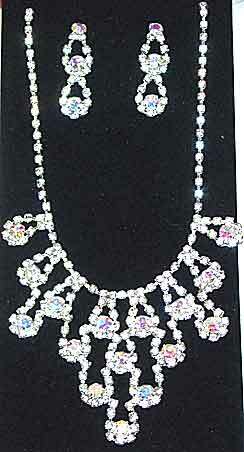 Sides of necklace also use rhinestone set parts alternating with the round pearls all the way around the necklace. Foldover clasp with plain silvertone metal extender. Clip earrings use same components as the necklace. Earrings measure 1 13/16" x 9/16", necklace is difficult to measure but is at least 16"; if needed, extender would add another 1". 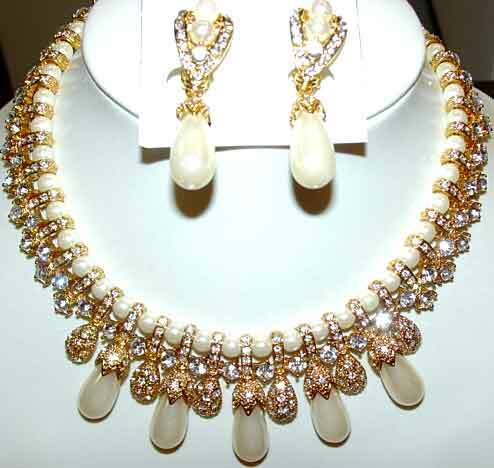 Description: Elaborate White Pearl/Clear Rhinestone/Goldtone Necklace & Earring Set - A different color combination of style OS3-411. Central motif alternates rhinestone set "paddles" with rhinestone capped white "eggplant" shaped glass pearls, all suspended from a row of smaller round white glass pearls. 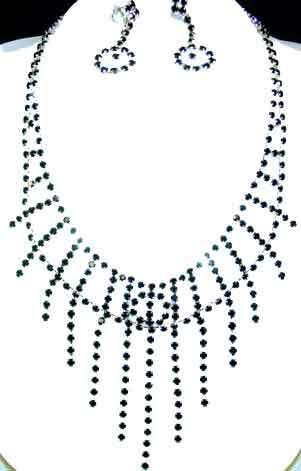 Sides of necklace also use rhinestone set parts alternating with the round pearls all the way around the necklace. Foldover clasp with plain goldttone metal extender. Clip earrings use same components as the necklace. Earrings measure 1 13/16" x 9/16", necklace is difficult to measure but is at least 16"; if needed, extender would add another 1". 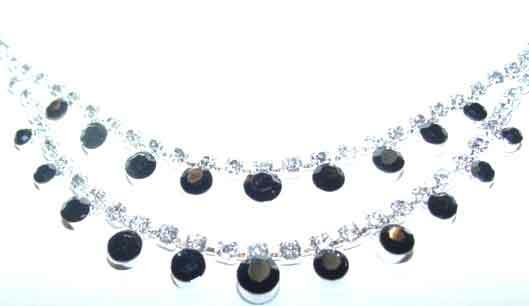 Description: Solid 3 Row Black Diamond Rhinestone Collar and Earrings Set - Three rows of rhinestones are soldered into a smoothly curving collarette. 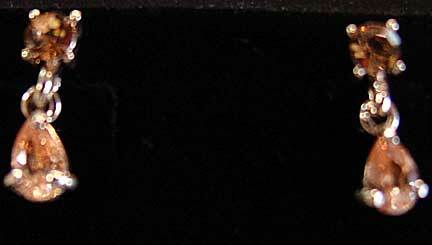 Darkened silvertone, 14 3/4" x 1/2" wide; 1 1/2" opening. Pierced earrings are 1" x 7/16". This is made to sit at the base of the neck and has a certain amount of flexibility to get on and off; if you have never had a solid collar before you will want to put this on and off carefully. Highly evocative of the classic glamour of the 1950's, (think Grace Kelly). Elegant. 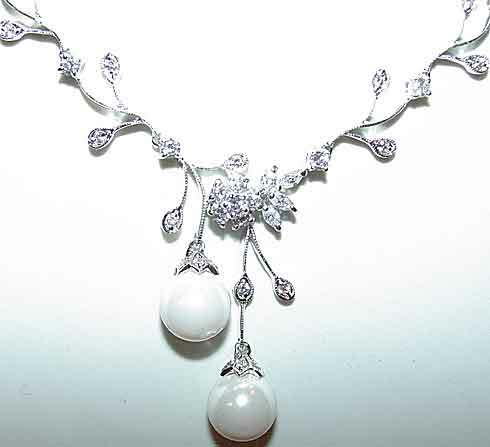 Description: Sterling Cubic Zirconia Freshwater Pearl Necklace and Earring Set - Beautiful for a bride, mother of the bride, or just about anyone else! 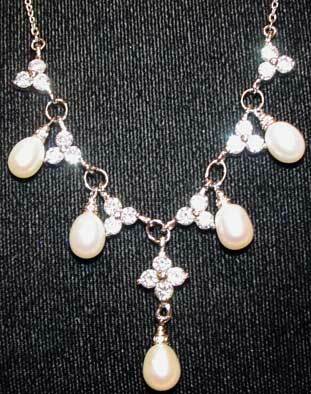 Necklace features CZ's in groups of threes and four, with freshwater pearl dangles. 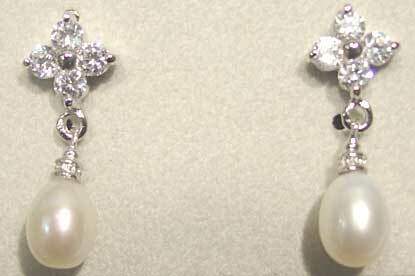 Earrings use the same motif as the center of the necklace. All pieces are rhodium plated so you don't need to worry about tarnish removal. Earrings are pierced, 7/8", and necklace is adjustable, 15" to 16". Center drop on necklace is 7/8". Beauty is a joy forever. Description: Sassy South Blush Pink/Clear Necklace and Earring Set - Done with clear glass rhinestones and blush pink (light pink) colored lucite pears and ovals, this has an adjustable necklace (from 13 3/4" to 18") and 1 5/8" x 3/4" pierced dangle earrings. Y drop on necklace is 2 1/4" from bottom to top and follows the earring pattern. Silvertone setting, very reasonable price. 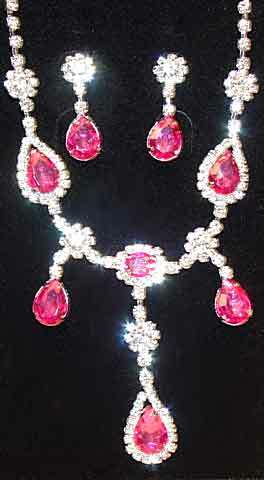 Description: Sassy South Rose Pink and Clear Rhinestone Necklace and Earring Set - Done with clear glass rhinestones and rose pink lucite pears and a single oval, the necklace adjusts from 14" to 18". Pierced earrings are 1 3/8" and echo the side drops. Center necklace dangle is 2 1/2" top to bottom. Rose pink is a warm, deep pink - very pretty! Very well priced. Description:Sassy South Lt. Siam/Hyacinth and Clear Rhinestone Necklace and Earring Set - Done in clear glass rhinestone and emerald green lucite pears in two sizes, this necklace design combines Y styling with festooning sides. Necklace adjusts from 14" to 18 1/4"; earrings are pierced and dangle 1 3/4". Necklace center drop is just shy of 3" top to bottom. Silvertone, again an excellent price point. Lt. Siam is a red orange; hyacinth is a true orange (think of the color of an Orange Crush soda) - this color is maybe halfway in between, but should be just right for anything needing a fairly intense orange. 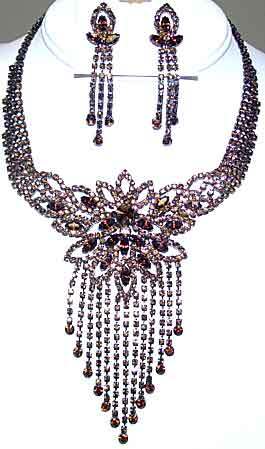 Description: Glam Gemz Black Rhinestone Fringe Bib Necklace Set - All black rhinestones set in silvertone. 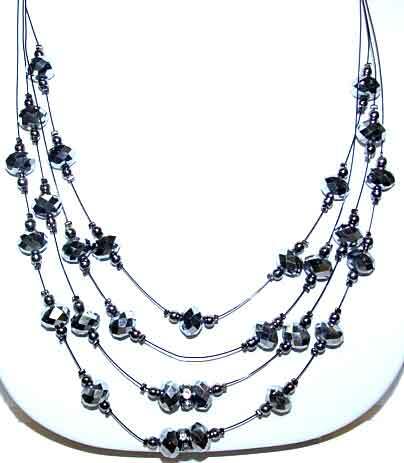 Necklace adjusts from 14" to 16 1/2"; longest (center front) dangle is 3". 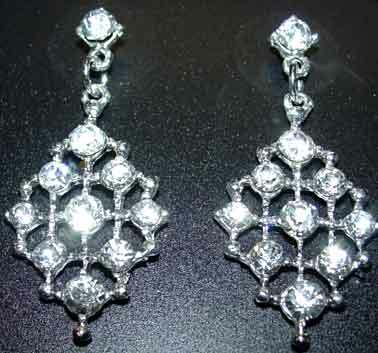 Circular motif at center front is repeated in the bottom of the dangle earrings, which suspend from a diamond pattern; 1 3/4" x 5/8". Earrings are pierced. 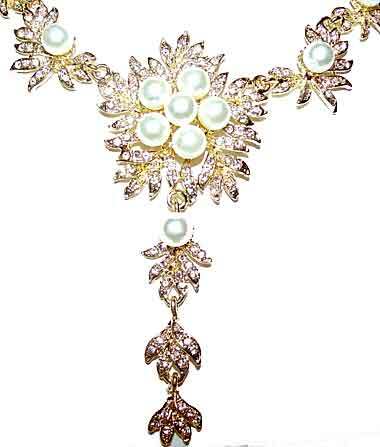 Description: Glass Pearl and CZ Delicate Asymmetrical Necklace - Beautiful design, with small round and marquise clear cubic zirconia stones. 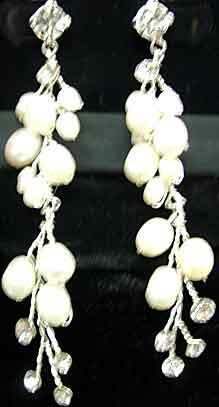 White pearls are glass, about 10mm. Small center floral done in rounds stones, with four marquises for leaves, and vining branches that go up both sides of the chain that are finished with small CZ's, with slightly larger rounds spaced regularly between the branches. Back part of chain is done in curving metal links. Lobster claw clasp, 16" plus 2" of extension chain. Silvertone. Perfect for the bride, or anyone going to a special function, who wants a delicate look over and above the standard fare. 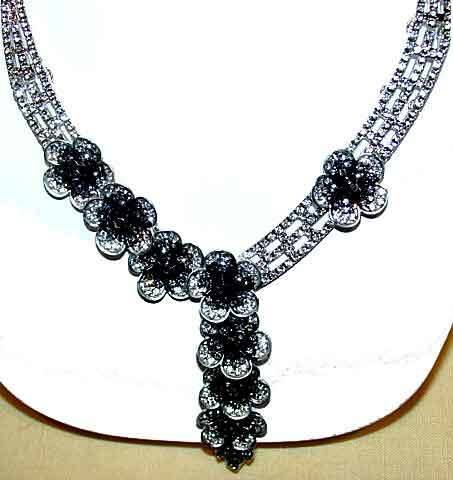 Description: Black and Clear Rhinestone Thin Navette Necklace and Earring Set - Nine jet black navettes (marquises) accent the center of the necklace, bordered by clear rhinestone chain, with double row clears that taper to a single row. Necklace adjusts from 14 1/2" to 18 1/2"; earrings are pierced, 1 3/4". Silvertone. Very pretty! 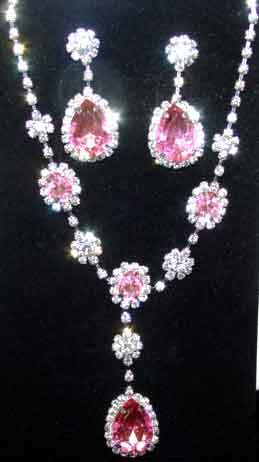 Description: Rose Pink and Clear Rhinestone Navette Demi Set - Necklace, bracelet and earring set for one low price. 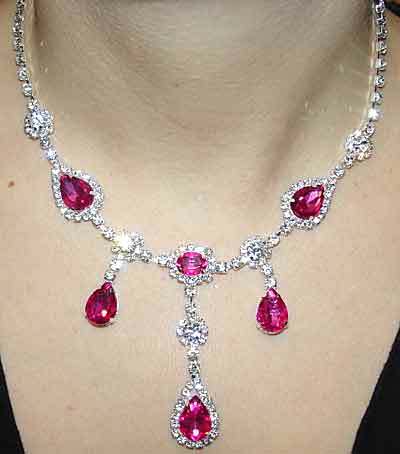 Thin pink navettes are surrounded with a marquise shaped frame, with the center of the necklace being double bordered. Bracelet has the single bordered center motif with open loops on either side, pierced earrings also have single borders and hang from a pink round rhinestone. Necklace adjusts from 14 1/4" to 18 1/4", center is 1 1/2". 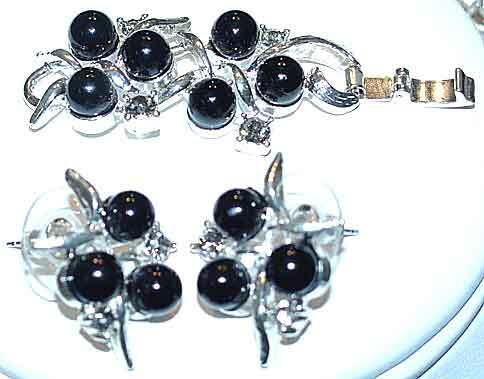 Earrings are 1 1/4" and bracelet is adjustable from 7" to 8 1/2". Silvertone; classic! 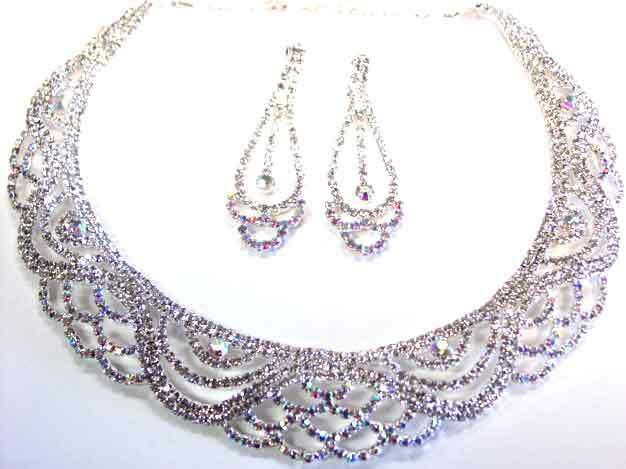 Description: Sassy South Five Strand Clear Rhinestone Festoon Necklace and Earring Set - What a beautiful set for wearing with a strapless solid color gown. 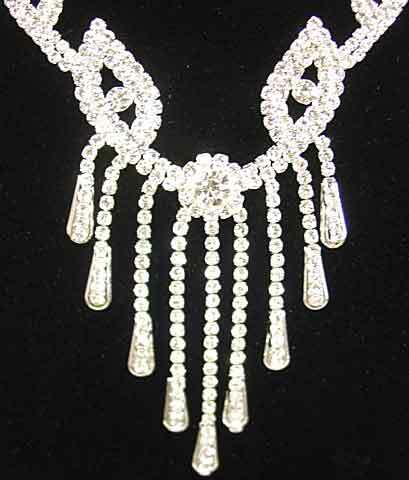 Set in silvertone, this has 6 "gathering points" with the smallest festoons toward the back of the neck having 3 rows of clear rhinestone chain, progressing to 4 rows at the side, and 5 rows around the center front, with two rows of straight rhinestones at the back on either side of the lobster claw clasp and adjustable length open chain. Interior measurement approximately 16" with additional 3" chain for adjustment, 2" at widest point. Pierced earrings are 1 7/8" x 3/4". 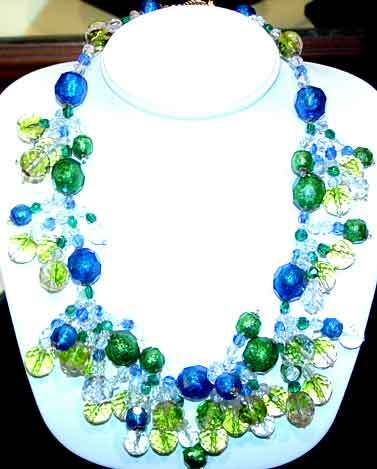 Description: Fantastic Coppola e Toppo Copy in Greens & Blues - Done by a Minneapolis, MN bead artist, this incorporates both vintage Bohemian glass beads in both bi-colored and clear, Swarovski crystal in sapphire, emerald, sapphire AB and emerald AB, as well as clear, and unusual plastic beads that apparently have a solid copper core, in capri (peacock) blue and green tourmaline. Bi-colored beads are chartruse with a hint of peach Heavy enough to be substantial feeling, but the plastic beads (that do NOT look like plastic) keep if from becoming unwieldy. This is a very labor intensive piece with LOTS of components, and at about 20% of the price of a genuine CeT piece, this is well worth the price tag. Approximately 17", with the longest dangles being about 1 3/4". This was photographed with flash, so colors will be more intense in person. Super as a juxtaposition with casual clothing, this would make a knockout runway type piece for even the most elaborate of eveningwear. 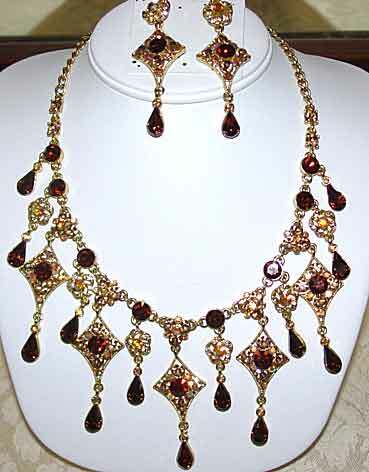 Description: Magnificent Dangling Bib Necklace & Earring Set in Multi Topaz Rhinestones - Wow! 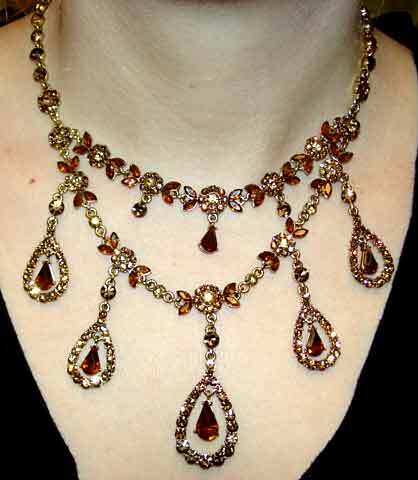 Large smokey topaz rounds are surrounded by Colorado topaz and topaz aurora borealis rhinestones, with smokey topaz rhinestone pears dangling off the ends. The necklace alternates smaller and larger dangles, while the earrings use elements from both to create beautiful dangling pierced earrings. Back portion of necklace is chain for adjustability, this will fit up to an 19 1/2" neck; earrings are 2 1/2" long. The perfect pieces for any brown strapless evening gown. 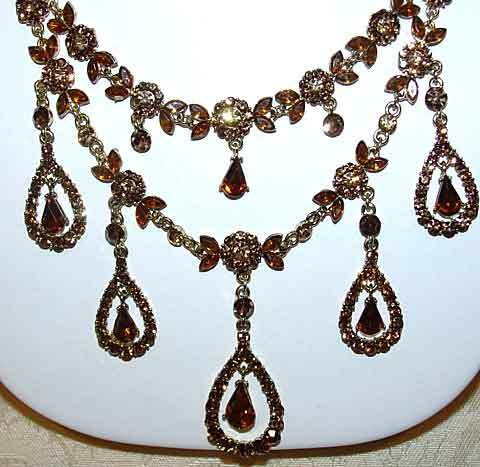 Description: Wonderful Smokey Topaz and Clear Rhinestone Bib Necklace and Earring Set - If you love brown, here is a great set for wearing with a formal gown or even a v-necked top. 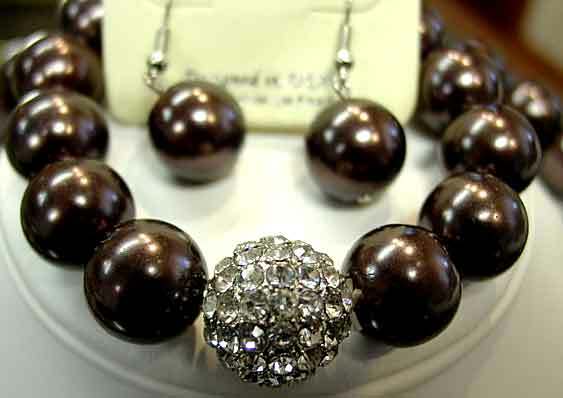 Dark brown has been a difficult color to find, especially combined with clear stones and set in silvertone. 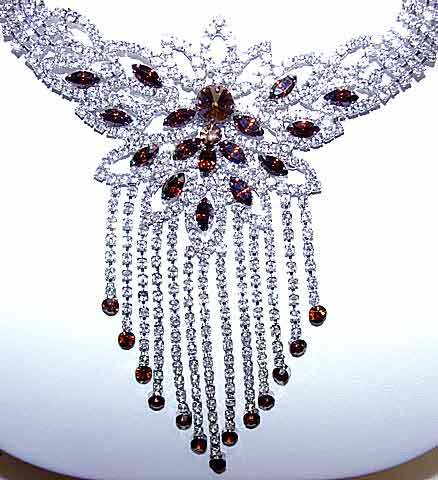 This features a rivoli cut brown stone flanked by other brown marquise stones. 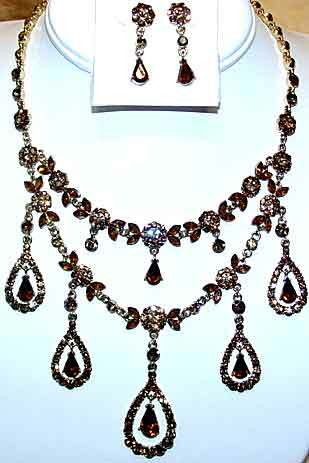 Dangles on both the necklace and the earrings terminate with round brown stones. 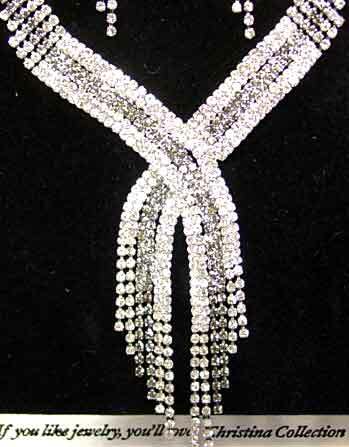 The remainder of the set is all clear rhinestone chain that graduates from two to five rows around the "collar". Adjustable from 13 1/2" to 15" (more extension chain could be added if needed); center dangle is 4 1/2". Pierced earrings dangle 2 1/2". 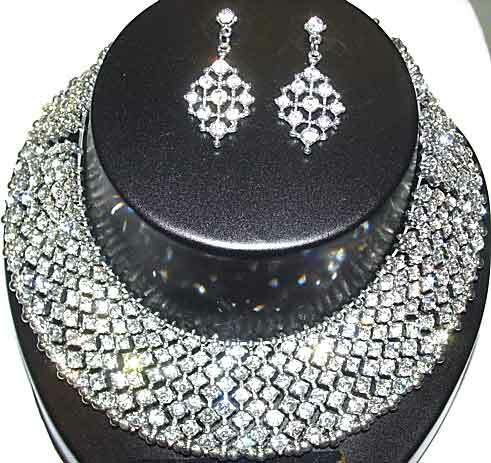 A set with lots of sparkle and an excellent addition to any jewelry collection. 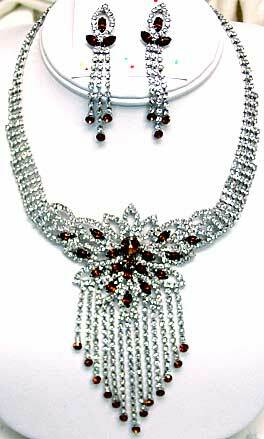 Description: Smokey Topaz Rhinestone Bib Necklace and Earring Set - The same design as OS1-170, but done in all smoked topaz rhinestones. 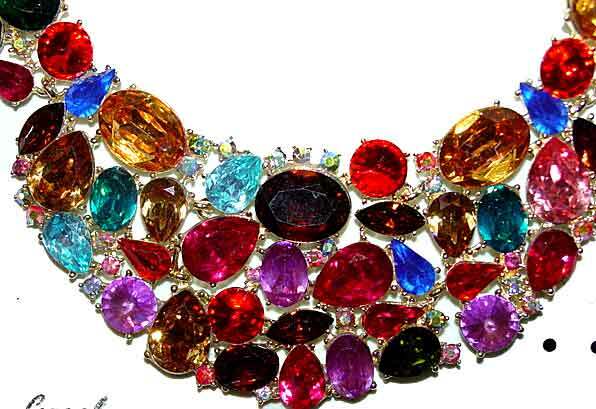 Slightly more expensive due to the use of colored stones throughout. 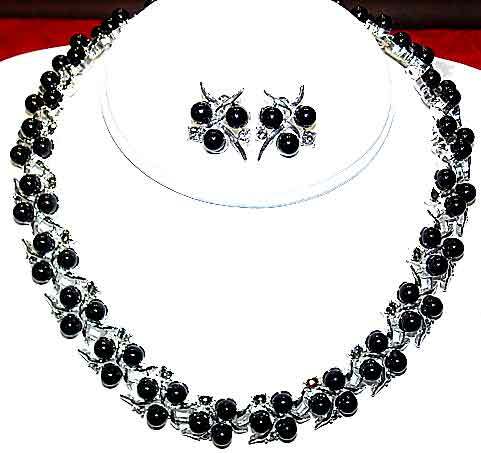 Description: Black Glass Ball and Rhinestone Choker Necklace and Earring - Gorgeous, classy set of necklace and pierced earrings with each link set with three black glass balls and 2 black diamond (grey) rhinestones, 24 links in all, plus a self extender that uses two more links. Earrings use same link design. 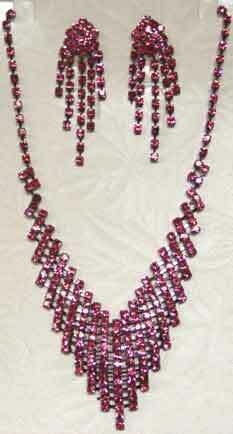 Necklace is 16" without extender, 18" with; 3/4" wide. Earrings are 3/4" in diameter. Silvertone setting. 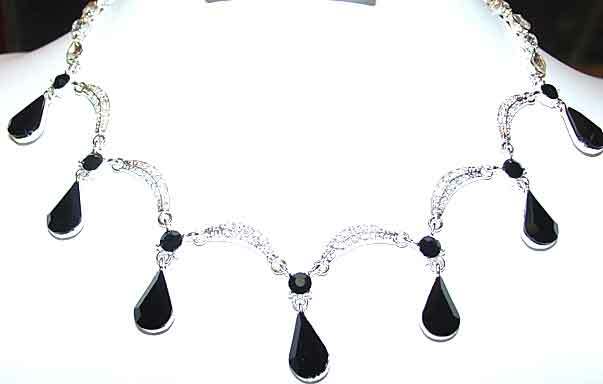 Description: Black and Clear Rhinestone Scalloped Necklace and Earring Set - 6 pave set scallops separate 7 large black pear shaped glass dangles from single black round stones. 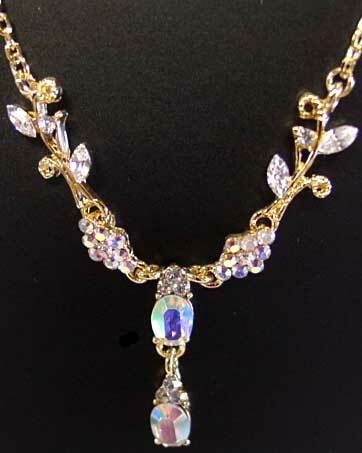 Back chain is fancier than normal with clear rhinestone pears alternating with clear rounds. 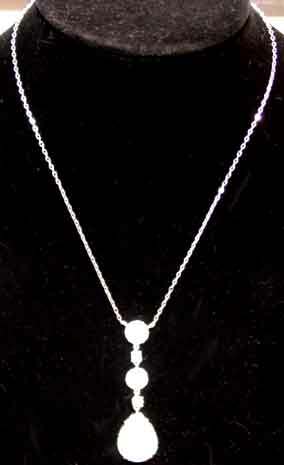 Necklace is 15" with 3" of additional link chain for adjusting up to 18". Earrings echo the black pear drops along front of necklace and are pierced, 7/8". Really pretty design. 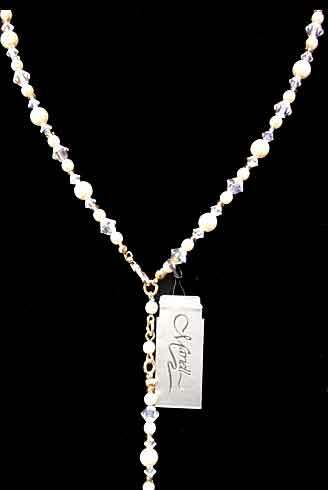 Description: Giovan Triple Strand Dog Collar Necklace - Beautiful creamy faux pearls in 5, 5.5 and 7.5mm are in triple strands; each pearl is separated by a tiny gold ball or by rhinestone rondelles. Rhinestone connectors at regular intervals and at ends. Hook and chain closure, adjusted to fit up to about 15.5". 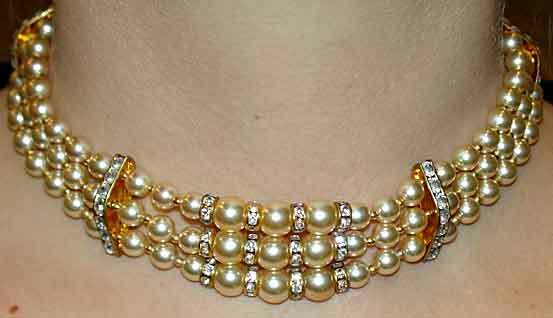 This is made to stand up on the neck, not lay down choker style. Excellent quality. 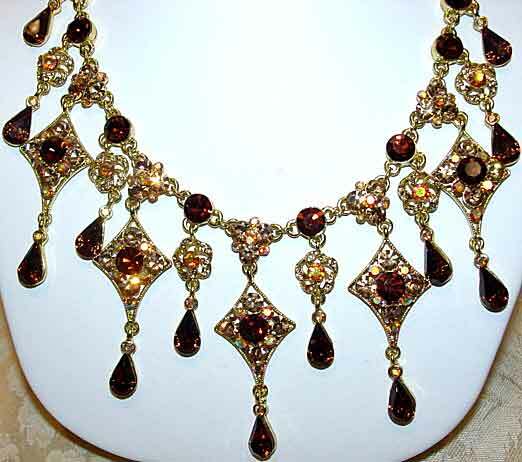 Description: Sassy South "Louise XIV" Necklace and Earring Set in Multi-Topaz Rhinestones - Another great set for wearing with almost any shade of browns, this uses no aurora borealis stones but does use light and dark Colorado topaz rhinestones and smokey topaz rhinestones. 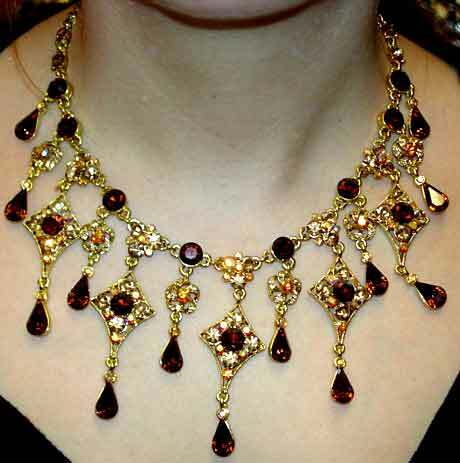 The necklace uses a small floral motif with marquises stones for "leaves" and dangle pears are surrounded by a larger all rhinestone set pear shaped frame. Double strand gives a sumptuous yet airy feeling, and smaller stones give this more delicateness. Back part of necklace is a gold metallic "stone" chain, not an arumed stone but made to look as if it is. Adjustable chain clasp, will fit up to an 18 1/2" neck. 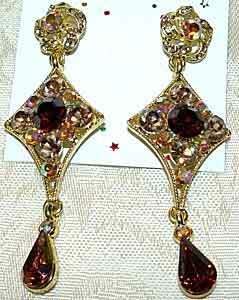 Pierced earrings are 1 1/4" long and a nice balance to the more ornate necklace. 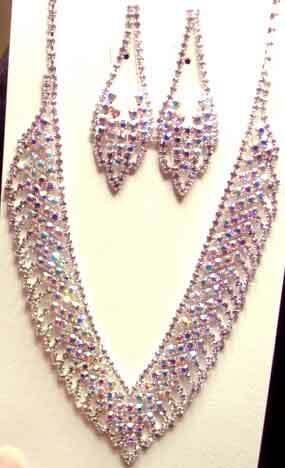 Description: Sassy South Clear Rhinestone Dangling Festoon Necklace and Earring Set - Done in all clear rhinestones. Description: Clear Aurora Borealis Buckle Style Dog Collar Necklace Set - While strapless dresses make up the bulk of what is being shown in special occasion dresses this year, halter styles are a strong second, and this may be just what you need . Very sparkly aurora borealis rhinestones make up this entire set, with 7 rows of solid soldered rhinestone chain going to 6 rows of line soldered; back connection is a single line or stones; adjustable to fit up to a 17" neck. Pierced earrings are 5/8" square, and hang in a diamond shape. A tremendous set to enjoy for years. 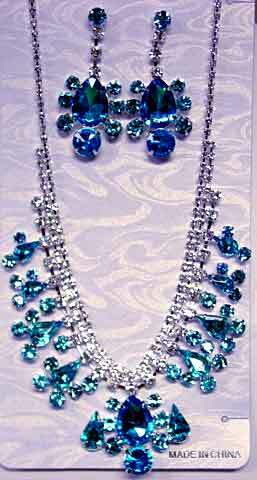 Description: Open Fringed Bib Necklace Set in Blue and Clear Rhinestones - Simple but classy set; necklace has 7 dangles with single medium blue rhinestones at the top and bottom, and earrings that echo those dangles. 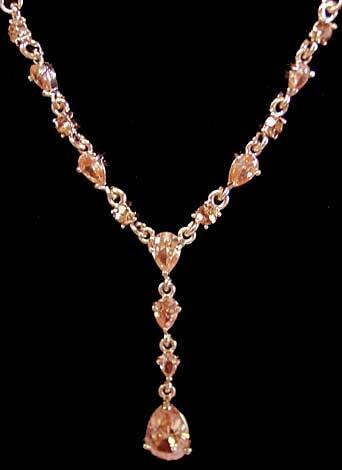 Necklace is 14" with an additional 3" link extension chain with adjustability up to 17". Dangles are 1" as are the pierced earrings. Silvertone. 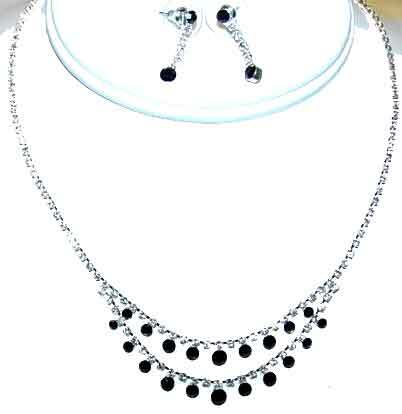 Description: Sassy South Black and Clear Rhinestone Two Strand Necklace and Earring Set - This necklace starts as a single strand but goes to a double strand with slightly graduated black rhinestones fringing the two strands. 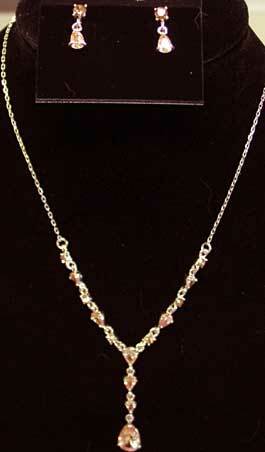 Necklace is 15" with a 2 1/4" extension link chain, making this adjustable up to 17 1/4". 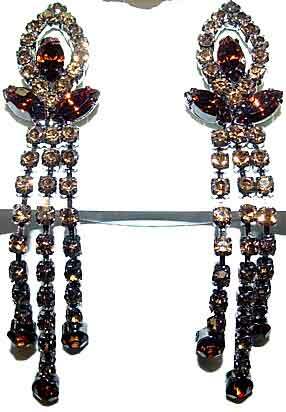 Pierced earrings have a single black rhinestone at either end, 7/8". 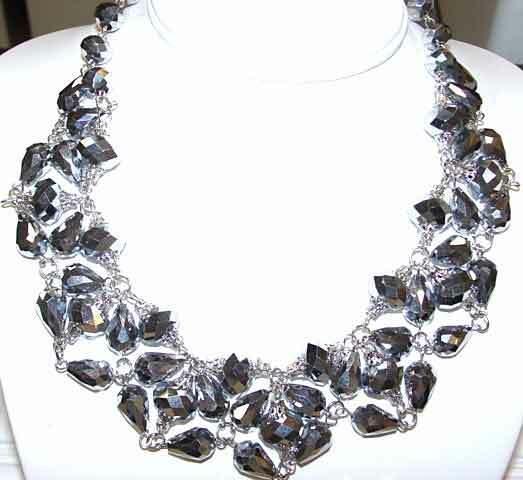 Description: Cathy's Concepts Clear Rhinestone Y-Style Necklace Set - Y necklaces are back and look great with all the low necklines popular this year. This one is adjustable from 12 1/2" to 15 1/2". Tiny clear rhinestone chain in silvertone. Matching pierced earrings are 3/4". Workable with more casual clothing, too! 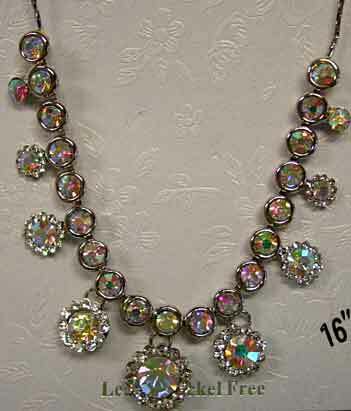 Description: Sassy South Clear and Aurora Borealis Rhinestone Modified Bib Necklace and Earring Set - I would consider this a modified bib as this piece is not huge by any means, but is a nice size for almost any age gal wearing a strapless dress, particularly if they are small-boned and are concerned about being "overwhelmed" by their jewelry. Adjustable necklace will fit up to a 17" neck; bib is about 1 3/4" at longest point and about 3" across. Earrings are pierced, 1 1/4" by 3/8". Silvertone setting, all stones prong set. 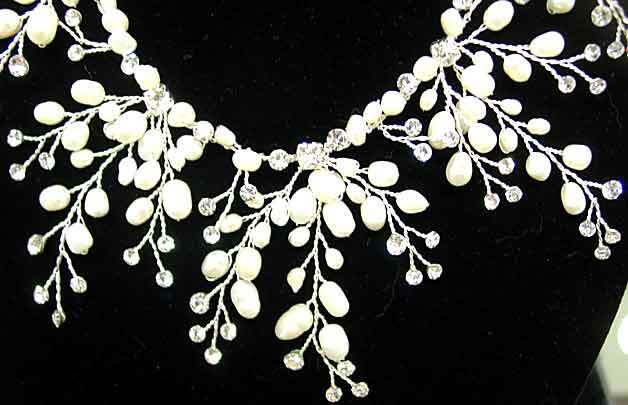 Description: La Marje Triple Strand Necklace - Three strands of luminous 5.5mm white faux pearls culminate in a leaf and ribbon motif done in silvertone and clear round and baguette rhinestones, out of which cascades and graduated four-strand pearl tassel. 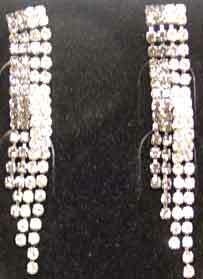 Rhinestone connectors at ends. Hook and eye adjustable clasp, up to approximately 16". Lovely for a bridal gown with a lower cut neckline. 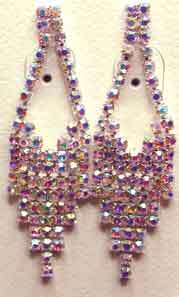 Description: Sassy South Bib Set in Aurora Borealis Rhinestones with Goldtone Setting - Lovely, delicate bib done in tiny rhinestone chain with all aurora borealis stones. Goldtone setting, which is difficult to find. 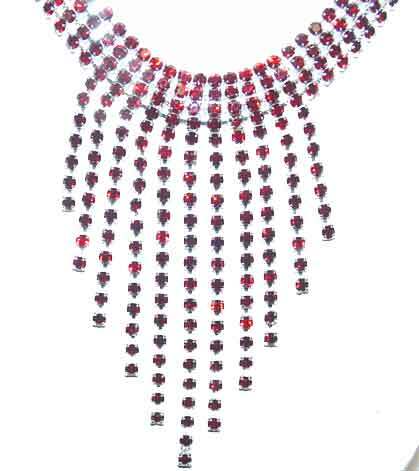 Necklace adjusts from 12" up to 15 1/2". Pierced earrings are 1" x 1/4". Longest dangle on necklace is 2" below the choker chains. Also available in all clear stones in goldtone (slightly less expensive than aurora borealis version, due to the aurora borealis stones being a more expensive stone). 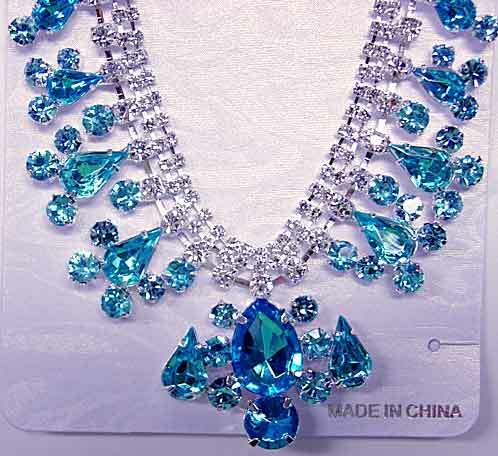 Description: Light Sapphire Blue and Clear Rhinestone Necklace and Earrings - A harder to find color, light sapphire blue is making a comeback as prom and special occasion dresses become available in a wide spectrum of pastels. This is in goldtone, also, a difficult combination to find. 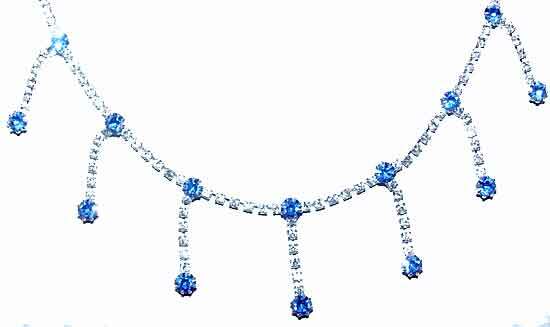 Necklace is 15 1/2", with a rigid center portion of double row rhinestone chain, and a center dangle with a pear-shaped blue stone. Twisted nugget type chain, spring-ring clasp. $28.00. 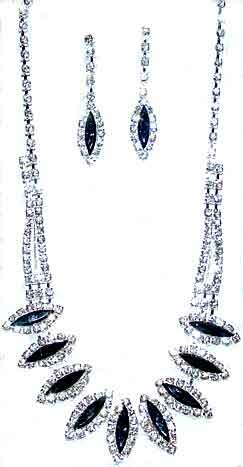 Co-ordinating pierced dangle earrings from La Marje, tiny bows of rhinestone chain from which dangle blue pears. 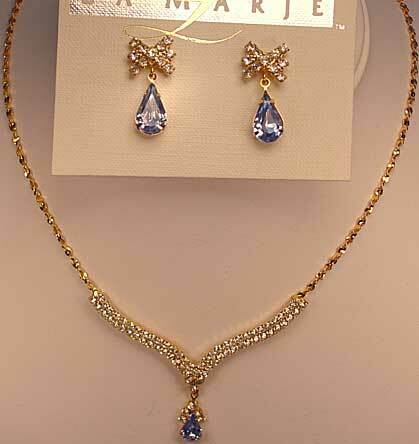 Description: Eternity Ball Necklace and Earring Set - While this would look wonderful for a special occasion, why wait? This would look great with that black dress, sweater, or suit. Three eternity balls (round balls pave set with clear rhinestones) in graduated sizes dangle from a heavier silvertone chain, which is approximately 17 1/2". Pendant portion measures 1 3/4"; bail is large but will not come off of the chain; however it could probably be removed and added to a different chain or neck cord if you wished. 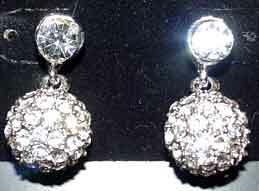 Matching earrings are pierced, and use a single eternity ball (the same as the largest one on the pendant) suspended from a single large rhinestone, about 7/8" long. A set to enjoy for many years. 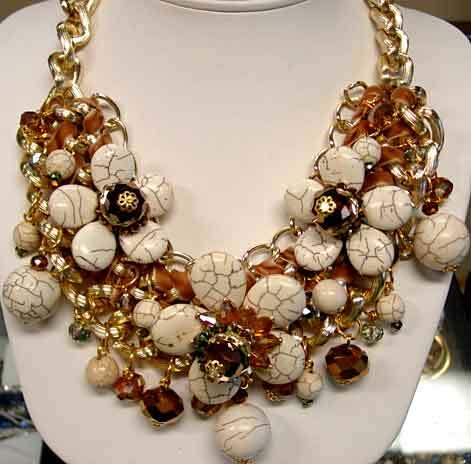 Description: Multi Color/Multi Shape Collar Necklace Set - This very popular design almost feels like someone took a handful of stones and shaped it into a necklace! Many of the less expensive versions use acrylic stones or back them on fabric (or both) rather then setting the stones in metal; we are happy to offer you an affordable version that uses glass stones paste set in metal. 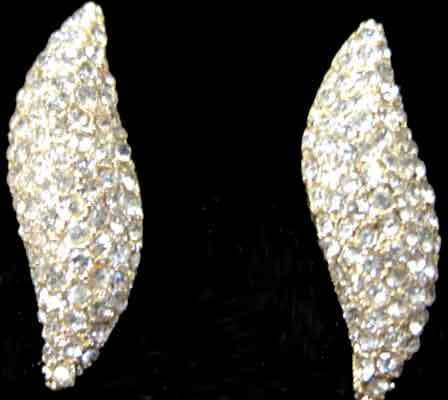 This uses large ovals, rivolis, fat and conventional pears, marquises and round rhinestones, all set in goldtone. Colors include emerald and olive green, rose pink, fuchsia, deep aqua, sapphire blue, light siam red, topaz and smokey topaz, and a lovely medium purple, all accented with various colored aurora borealis rounds. Adjustable chain closure should accomodate 18-22"; 2" at widest point. Pierced earrings are 1 7/8" x 3/4". 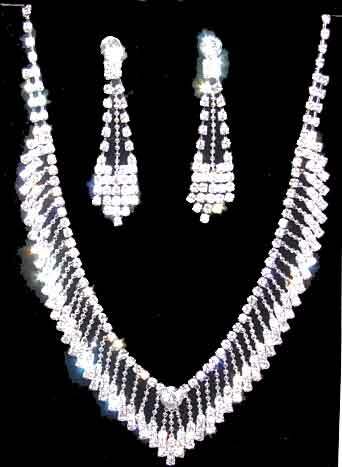 Description: Clear Rhinestone V'd Fringe Necklace and Earring Set - Actually the fringe is soldered together so it lays perfectly every time, but it looks like fringe. 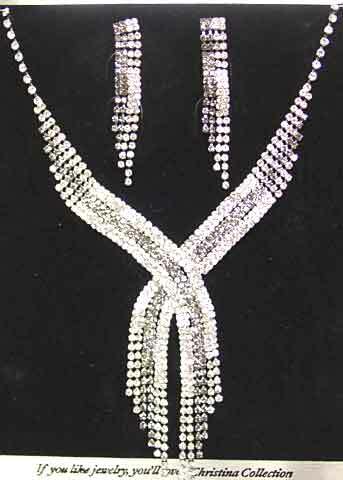 Three small rhinestones end a short tiny ball chain all the way around for the "fringe" and hang from a single row of rhinestone chain, which has a center larger round stone at the center of the V. Dangling earrings also use the ball chain and rhinestone chain and dangle from a single larger rhinestone round. Pierced earrings measure about 2" x 1/2". 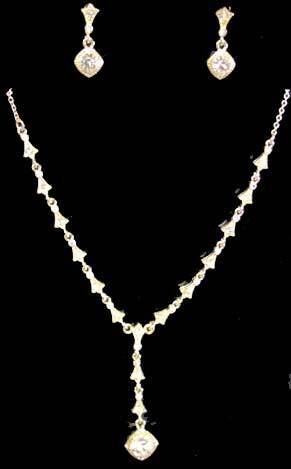 Adjustable necklace extends to about 17 1/2", and is 7/8" wide at center point. Very pretty and highly wearable design. Description: Cathy's Concepts Dark Metal and Clear Rhinestone Dog Collar and Earrings Set - This metal finish could perhaps be described as gunmetal but doesn't have any blue cast, so I would rather call it a dark antique silver or pewter-look finish. 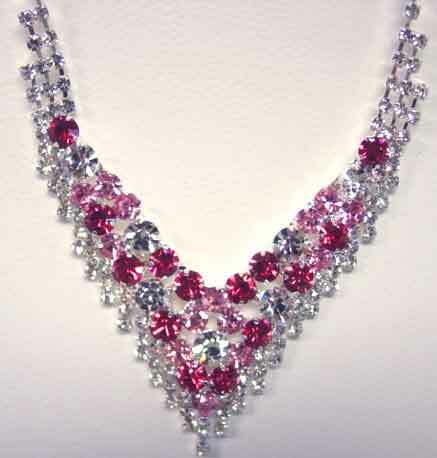 Five clear rhinestone "flowers" are separated by one stone rhinestone connectors; adjustable chain will fit up to a 16" neck size. Pierced dangle earrings measure 1"; dog collar is 1/2" at the widest part. 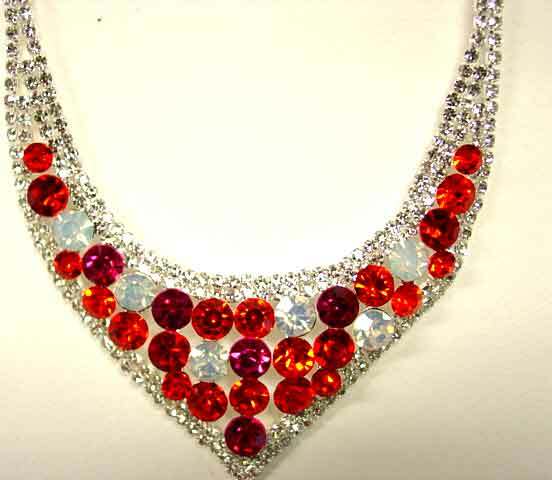 Description: Sassy South Red and Clear Rhinestone Zig Zag Design Necklace Set - This red is actually a lighter red, almost with a touch of orange to it. 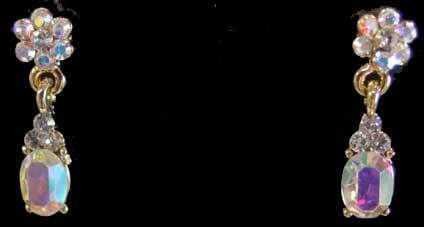 Variation on the y neck style with 3 dangles instead of one. Necklace is adjustable up to 19"; longest dangle is about 1 3/8". Pierced earrings follow the same motif and size as the dangle. Interesting interpretation of a classic design. 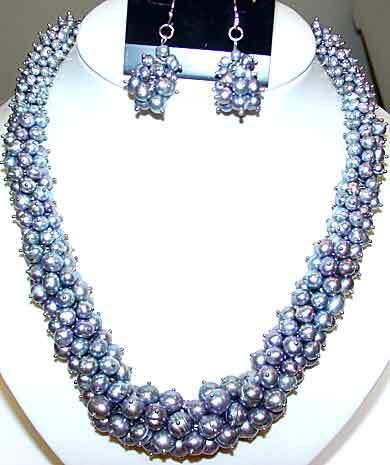 Description: Genuine Freshwater Pearl Necklace and Earring Set - Identical to OS4-432, but done in shades of grey/blue/purple. 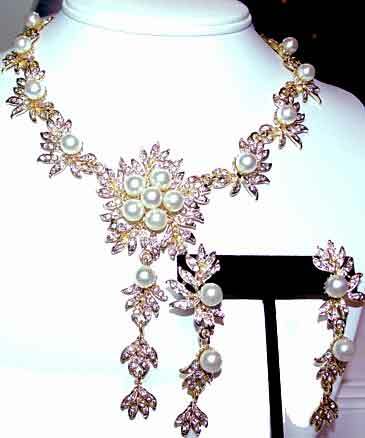 Description: Goldtone/White Glass Pearl/Rhinestone Necklace and Earrings Set - Pretty floral/foliate motif necklace in a Y style with matching long dangle earrings. Links are all pave set with tiny clear rhinestones and centered with 7mm white glass pearls. Earrings are pierced, 2 3/4" long and about 1/2" at widest point. Necklace has adjustable lobster claw/chain clasp and will go from 14" to about 17 1/2". Center is 4" from top to bottom of dangle, with linked portion of dangle being 2". With all the strapless bridal gowns being shown, this would make a nice balance, as well as being visible in group wedding photos. 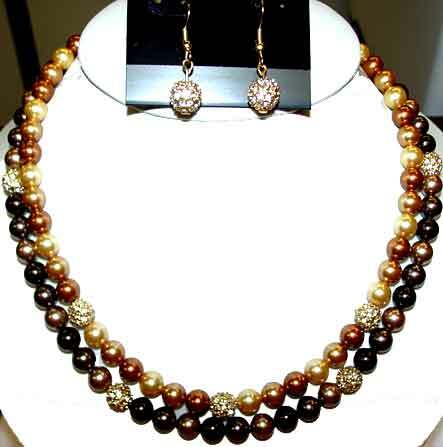 Description: DRH Designs Double Strand 3-in-1 Glass Pearl/Eternity Ball Necklace/Earrings Set in Shades of Brown - Top strand is done in gold/bright gold/copper Swarovski glass pearls with clear rhinestone eternity balls; lower strand is in bronze/brown/dark brown Swarovski glass pearls, also with rhinestone eternity balls. Both strands are attached with spring ring clasps to an eternity ball clasp, so you can wear this as a two strand necklace, or wear each strand individually. Three necklaces in one! Pierced french wire earrings are single eternity balls, so they will go with any of the combinations. Gold/copper strand is about 17", bronze/browns strand about 19". Top quality components make this a standout. 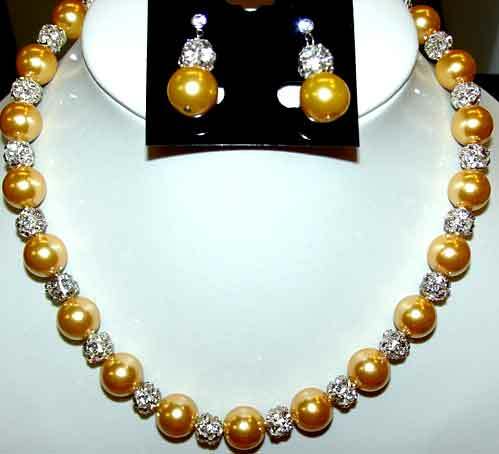 Description: Sassy South Goldtone Glass Pearl/Rhinestone Ball Necklace and Earring Set - This uses rhinestone balls as opposed to eternity balls - rhinestone balls have prong set stones that are larger than the paste set ones used in eternity balls. 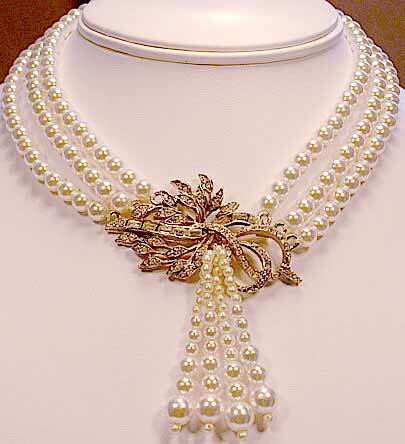 The colored glass pearls alternate with the rhinestone balls all the way along the entire strand of the necklace. 12mm glass pearls, 8mm rhinestone balls. Pierced earrings are 1", necklace has fish-hook safety clasp and measures 16 1/2". 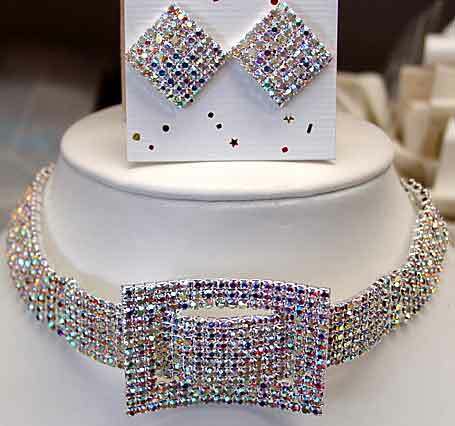 Description: Cathy's Concepts Clear Rhinestone Fringe Necklace and Earring Set with Square Rhinestones - This set features square cut clear rhinestones at the end of each piece of graduated rhinestone chain "fringe", giving it an elegant, princesse look. 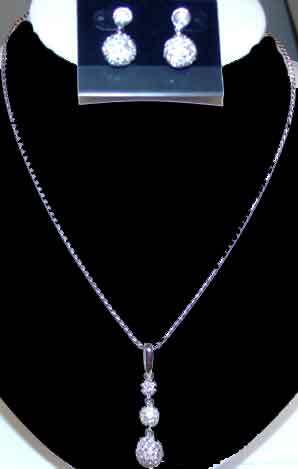 Necklace adjusts up to 17 1/2" and is slightly over 1" at the widest point. Pierced dangle earrings are about 1 1/4". Silvertone setting. 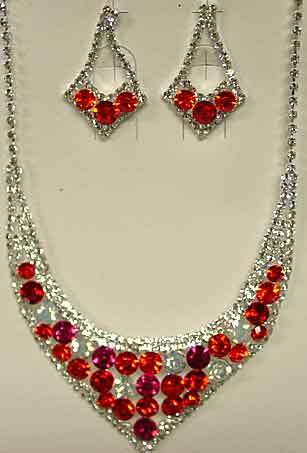 Description: Glam Gem Red Rhinestone Chain Bib Set - Is there anything more glamorous than red rhinestones? 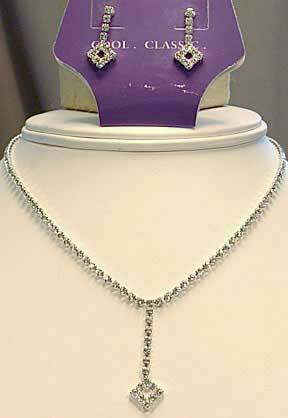 This 4 row chain extends to 17" (adjustable); bib portion longest chain is 3"; pierced earrings are 5 row and 1 1/2".